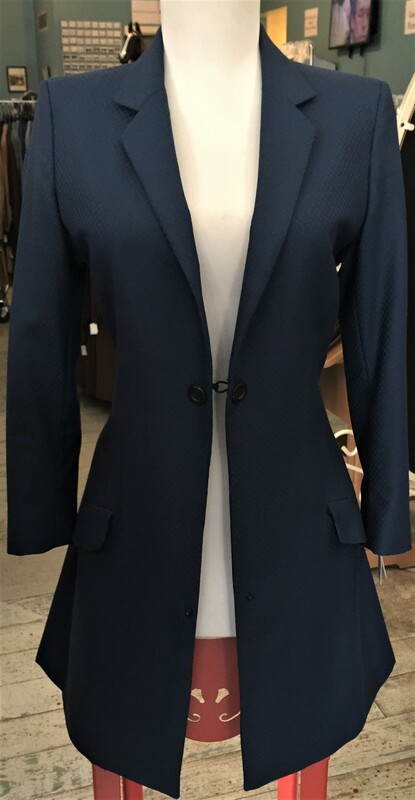 Girls Day Suits – Commotion! 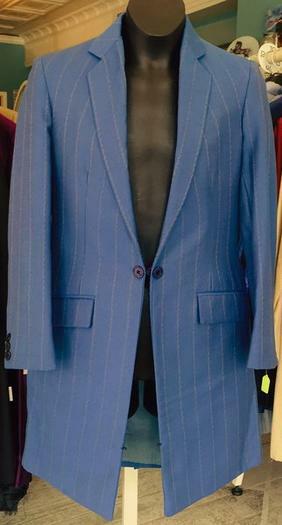 ***CONTACT US WITH MEASUREMENTS FOR OUR LATEST INVENTORY! 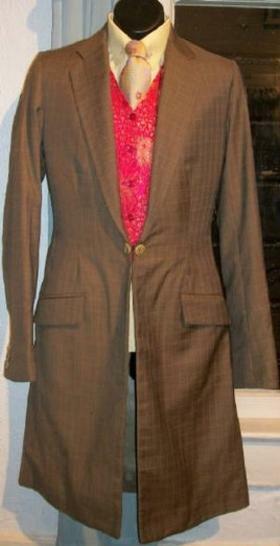 Suit would be suitable for a teen or small lady. 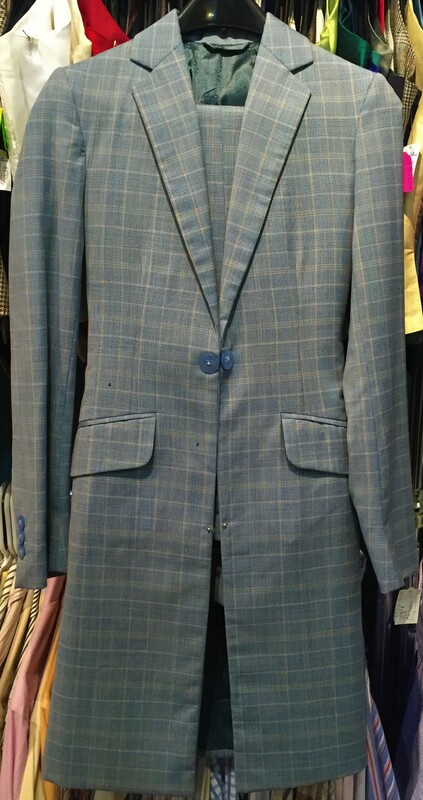 Suit is new with suede knee patches and intentional spur holes. 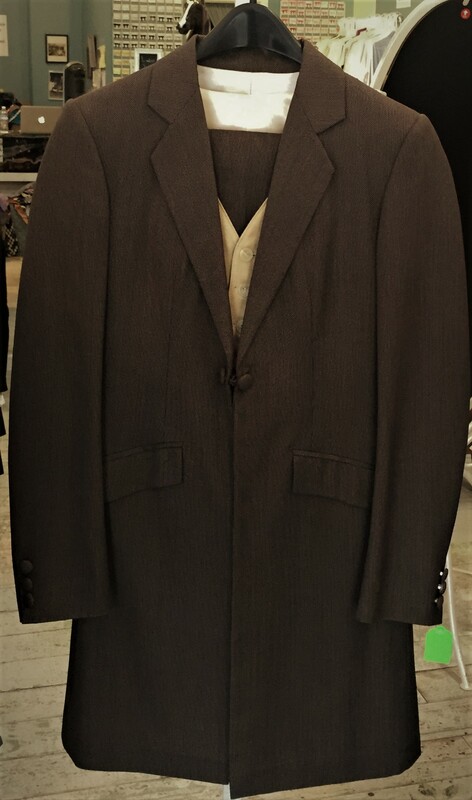 Jod Waist: 29" plus 2 1/2"
Inseam: 34 1/2" plus 2 1/2"
Sleeve: 23 3/4" plus 2"
Coat Length: 36 1/4" plus 2"
Jods have suede knee patches. 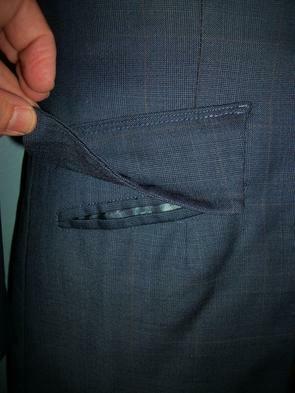 There is a two inch long stitched repair on right side of right front pocket on jods. 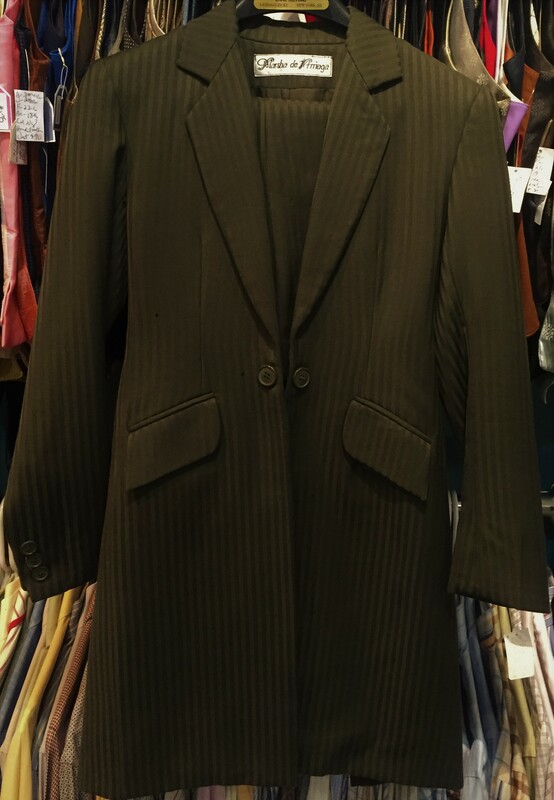 Jod Waist: 32" plus 0"
Inseam: 31 1/2" plus 2"
Sleeve: 21 1/4" plus 2"
Coat Length: 34 1/2" plus 1"
Jods have suede knee patches. Front corner of one jod pocket has tiny rip started. Bells have some nicks to fabric and one has a repair. 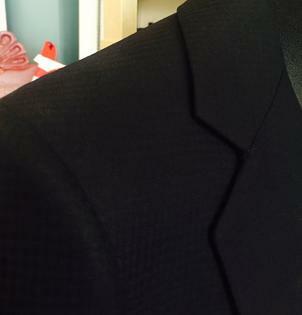 Lining at middle coat vent and right cuff has started to come unstitched. 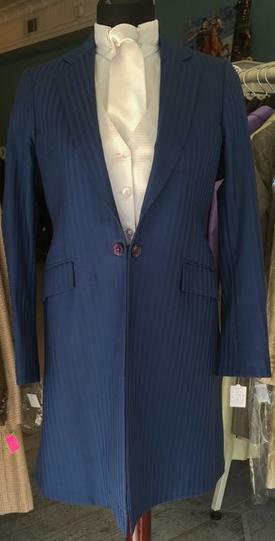 Jod Waist: 27 1/2" plus 3"
Inseam: 34 1/2" plus 0"
Sleeve: 23 1/2" plus 1"
Nape to Waist: 14 1/2"
Coat Length: 36 1/2" plus 0"
Coat was made by DeRegnaucourt but not so sure jods were (bells are pointed). Jods have suede knee patches and intentional spur holes. A corner on each front jod pocket has ripped. Bells have nicks to fabric, some small holes and one has small repair. Coat has snaps to hold skirts back. 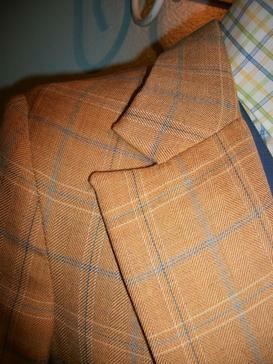 There are nicks to fabric on cuffs from when buttons were moved when length was let out. 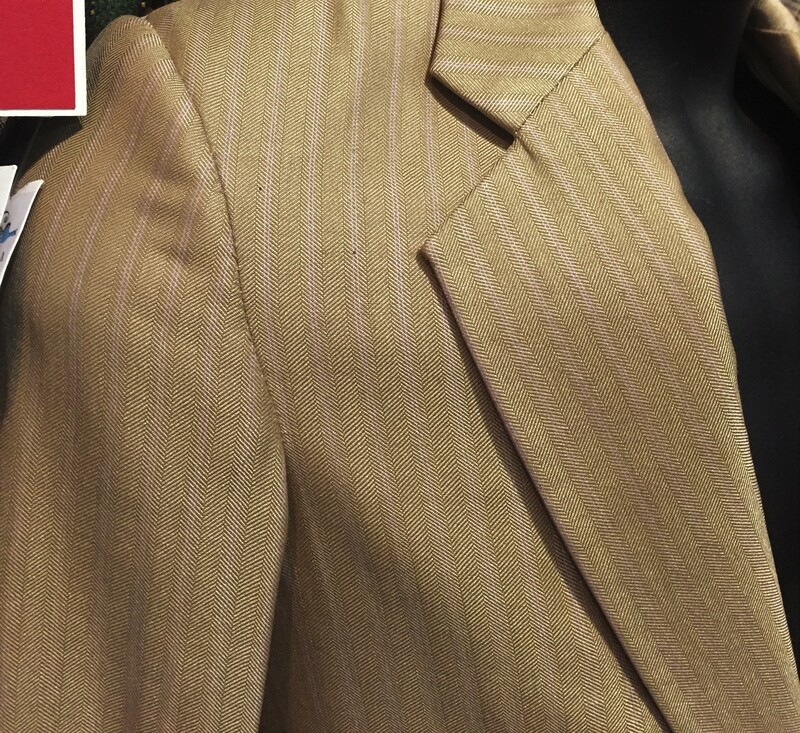 There are also nicks on back of coat and around where arm meets back. 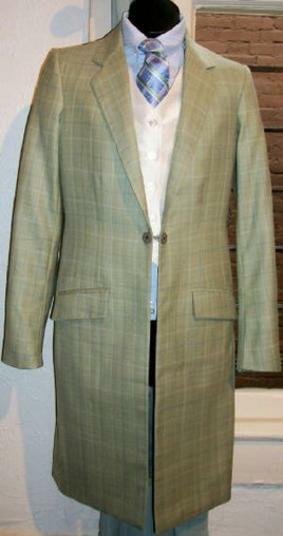 Inseam: 32 7/8" plus 0"
Sleeve: 22 1/2" plus 0"
Coat Length: 33" plus 2"
Suit was over $3000 new. 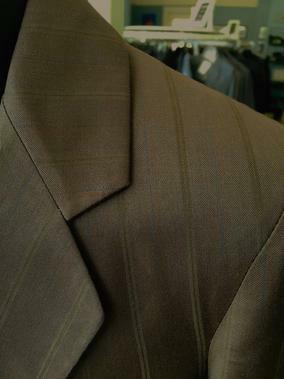 Fabric has sheen to it. 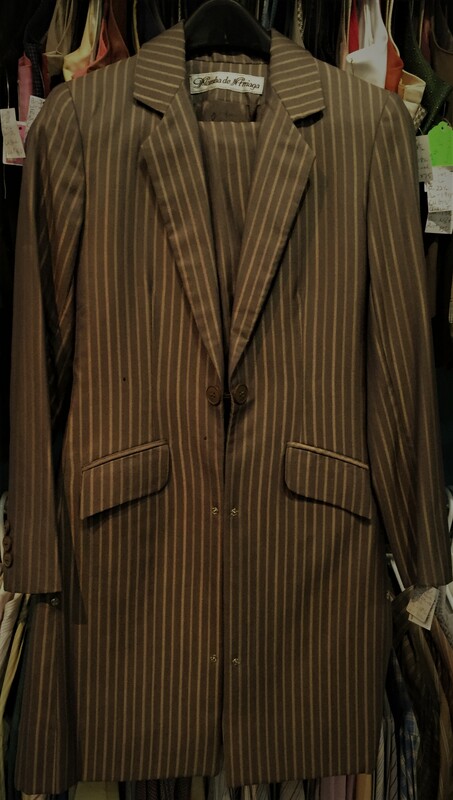 Jod Waist: 25 1/2" plus 3 1/2"
Inseam: 34 1/2" plus 2"
Coat Length: 36" plus 0"
Jods have suede knee patches. 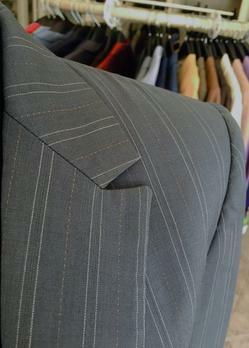 Jods are a touch shiny from dry cleaning. 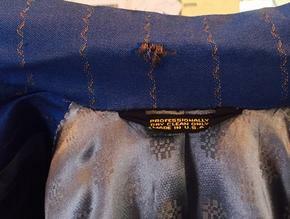 Hook closure needs tightened down and there is an area of nicks on back of coat that should be covered by number. Lining of one sleeve cuff has started to come unstitched. 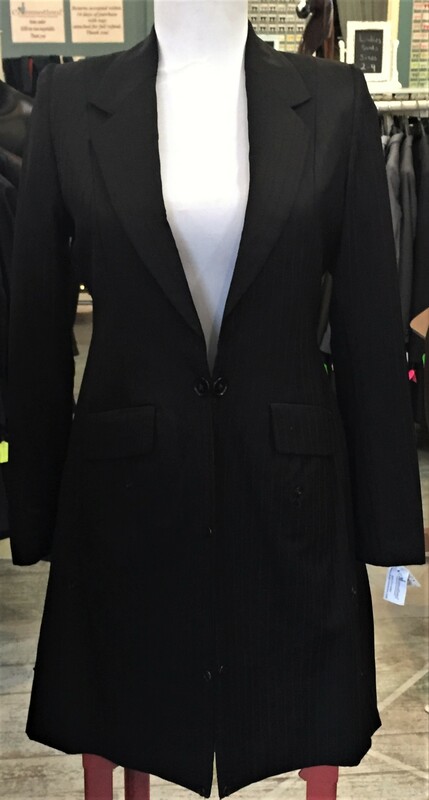 Jod Waist: 28" plus 0"
Inseam: 31 1/2" plus 0"
Coat Length: 32 3/4" plus 2"
Jods have suede knee patches and intentional spur holes. There is also a second set of spur holes that have been closed. Bells have some nicks and one has some fraying. Coat has snaps to hold skirts back. Jod Waist: 26 1/2" plus 0"
Inseam: 33 1/2" plus 0"
Coat Length: 33 1/2" plus 0"
Jods have suede knee patches and intentional spur holes. There are some nicks to bells and repairs around both spur holes. Lining at middle coat vent has ripped a tad. There are some nicks on back of coat from number pins. Jod Waist: 25 1/2" plus 6"
Inseam: 33 1/4" plus 0"
Sleeve: 2 1/4" plus 1 1/2"
Nape to Waist: 15 1/4"
Coat Length: 36 1/4" plus 0"
Jod Waist: 24 1/2" plus 1 1/2"
Nape to Waist: 15 1/2"
Coat Length: 34" plus 1"
Jod Waist: 29" plus 0"
Inseam: 32 1/2" plus 1"
Sleeve: 22 1/2" plus 1 1/2"
Coat Length: 33 1/2" plus 1 1/2"
Suit is prettier in person. Jods have suede knee patches. One bell has tiny amount of fraying on edge. 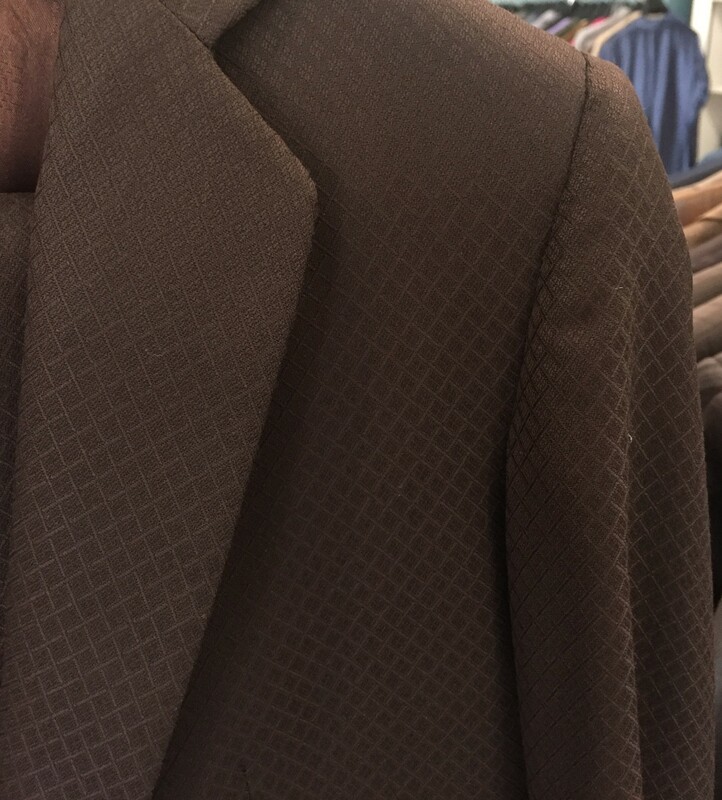 Back of coat has some nicks that should be covered by number. 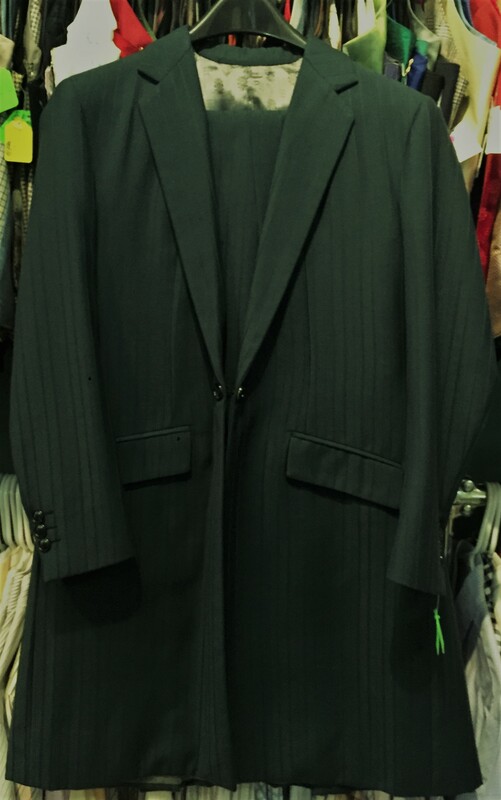 Inseam: 28 3/4" plus 2"
Nape to Waist: 12 3/4"
Coat Length: 31 3/4" plus 1 1/2"
Suit is straight from DeRegnaucourt and don't believe it was ever worn. 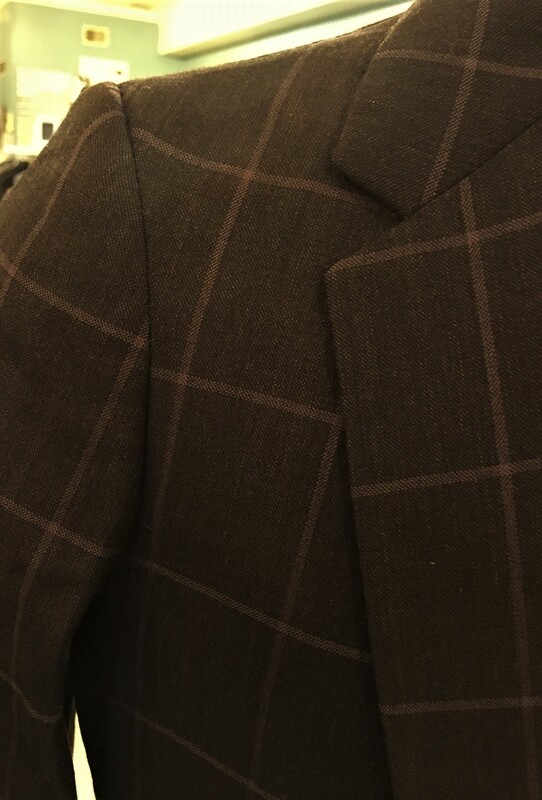 Hard to get photo color exact, suit is brown with an olive tone. 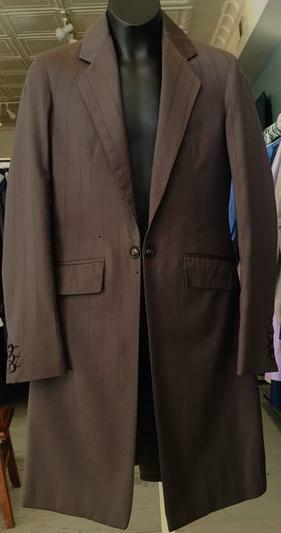 Jod Waist: 25 1/4" plus 4"
Inseam: 33" plus 2 1/2"
Sleeve: 24 1/4" plus 2"
Coat Length: 36" plus 1 1/2"
Suit is part of the DeRegnaucourt Apparel Upgrade Program. 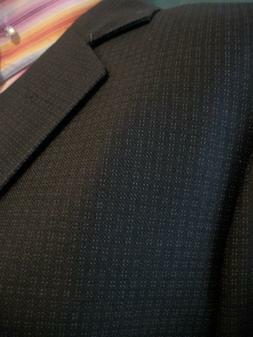 Color of suit is closest to close up photo. 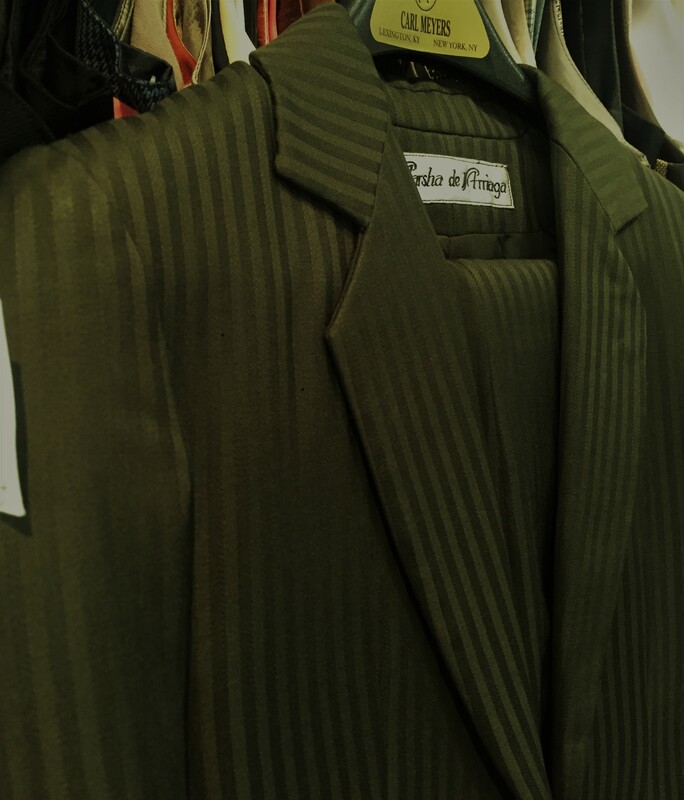 Suit has sheen in stripes. Jods have suede knee patches and intentional spur holes. There is some ground in dirt on horse side of bells that may clean out. There is also some mild discoloration near ankles on horse side (see photo). 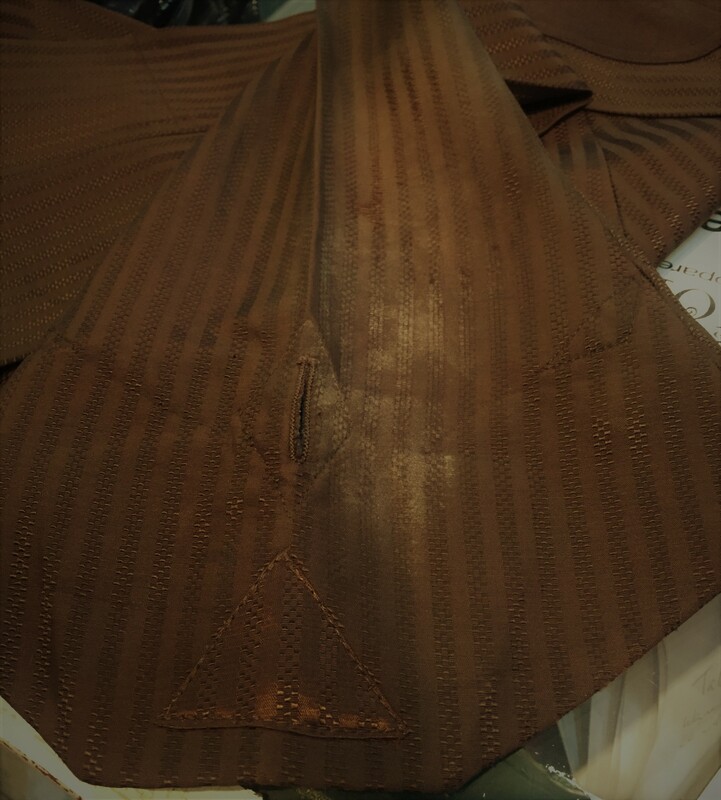 Triangle patches of the same fabric have been added on bottom of bells to cover a second set of spur holes and to reinforce fabric. There is some minimal fraying on bottom of one bell. Crotch has small 1/2" repair and so does seat. 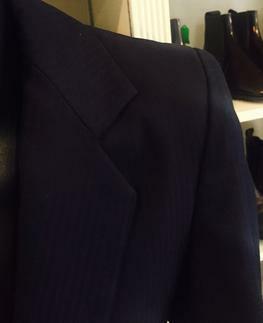 Coat has a few faint sweat marks on back of coat skirt. 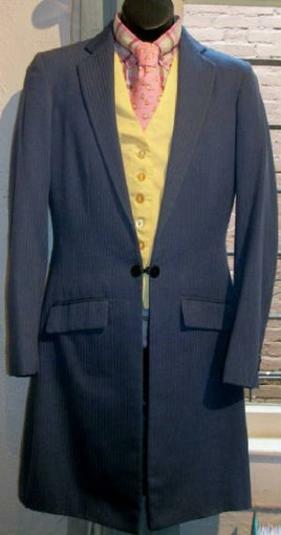 Jod Waist: 30" plus 1 1/2"
Inseam: 32 1/2" plus 2 1/2"
Sleeve: 24 3/4" plus 1"
Suit is suitable for a teen or small adult. Suit was never worn. Jods have suede knee patches. 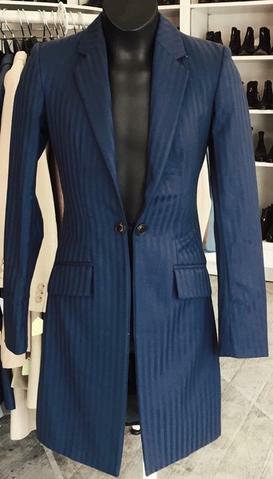 Jod Waist: 26" plus 4"
Inseam: 33 3/4" plus 3"
Nape to Waist: 15 3/4"
Coat Length: 36 3/4" plus 1 1/2"
Jod One: Have suede knee patches and intentional spur holes. There is velcro inside of jods to keep from dragging off the horse. Jod Waist: 26" plus 2"
Inseam: 34 1/2" plus 3"
Jod Two: Have suede knee patches and intentional spur holes. 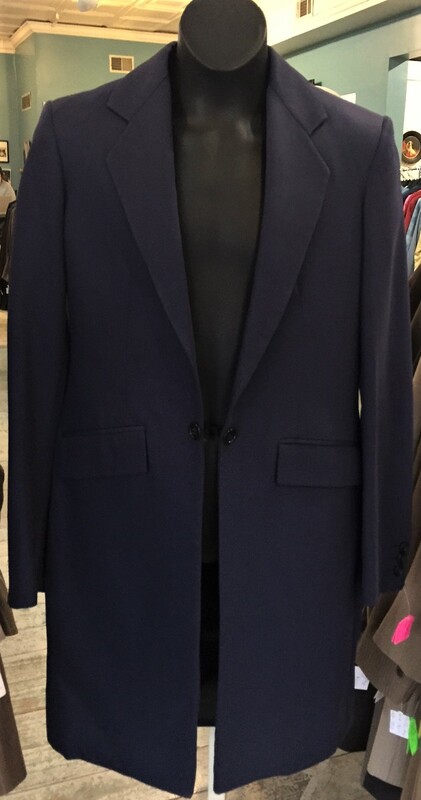 Jod Waist: 26" plus 2 1/2"
Inseam: 35 1/4" plus 0"
Nape to Waist: 14 3/4"
Coat Length: 34 1/2" plus 2"
Jods have suede knee patches and intentional spur holes. Two corners on one jod pocket and one corner of the other have been repaired where they ripped. 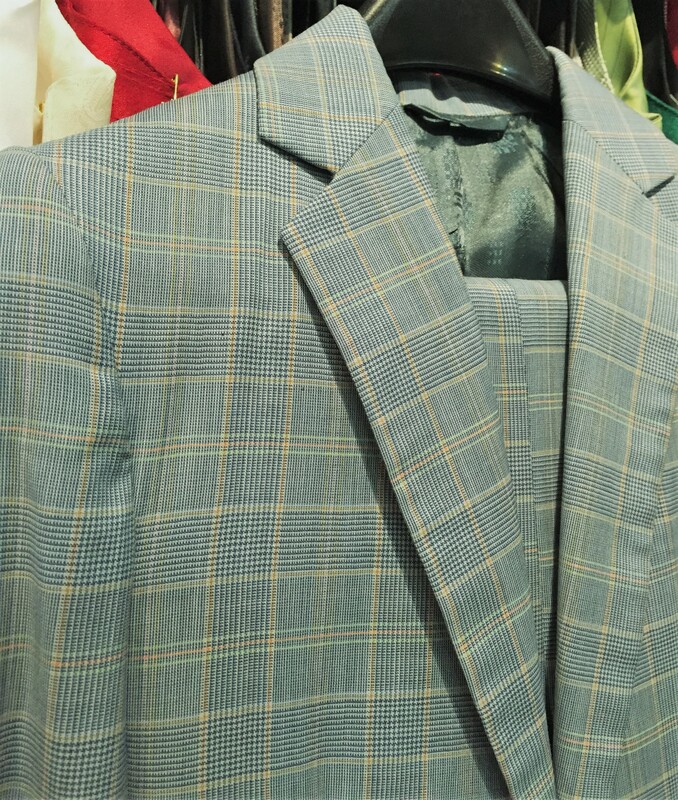 Suit has a few minor nicks to fabric. 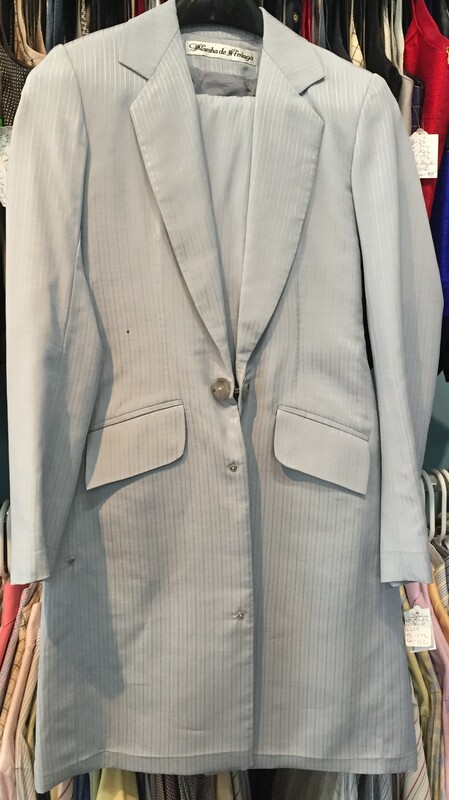 Jod Waist: 29 1/2" plus 3 1/2"
Inseam: 27" plus 2 1/2"
Nape to Waist: 13 1/4"
Coat Length: 31" plus 2 1/2"
Jod Waist: 27" plus 0"
Inseam: 28 1/4" plus 0"
Sleeve: 22" plus 2 1/2"
Nape to Waist: 13 1/2"
Coat Length: 31" plus 0"
Jods have suede knee patches. 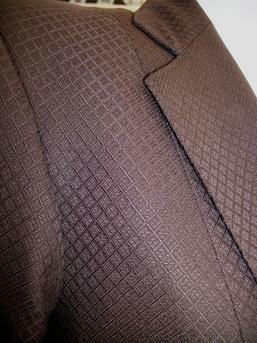 Lining around left arm hole and bottom of coat skirts has come unstitched in some areas. 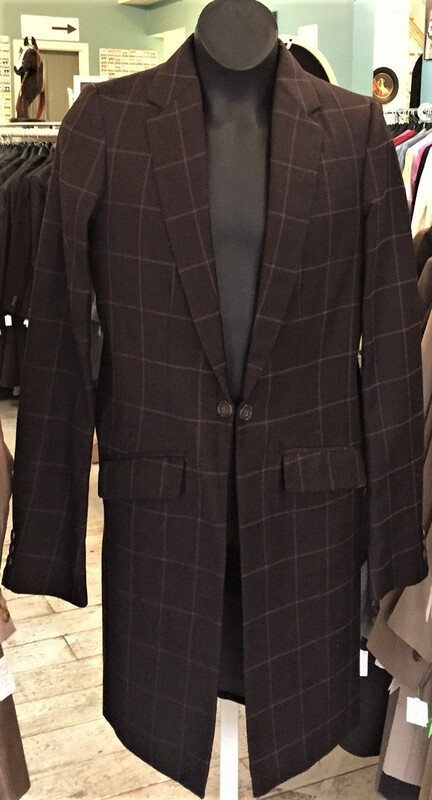 Sleeve: 20 1/4" plus 2"
Coat Length: 32 1/2" plus 2"
Jods have suede knee patches, suede across crotch/thighs and intentional spur holes. Jods have quite a few nicks. There is a small hole on left thigh. Fabric has been added on horse side of bells to make them wider over boots. Fabric on seat has gotten a tad pill-y. Lining around right arm hole has started to come unstitched. There are some tiny nicks to fabric on back from number pins. 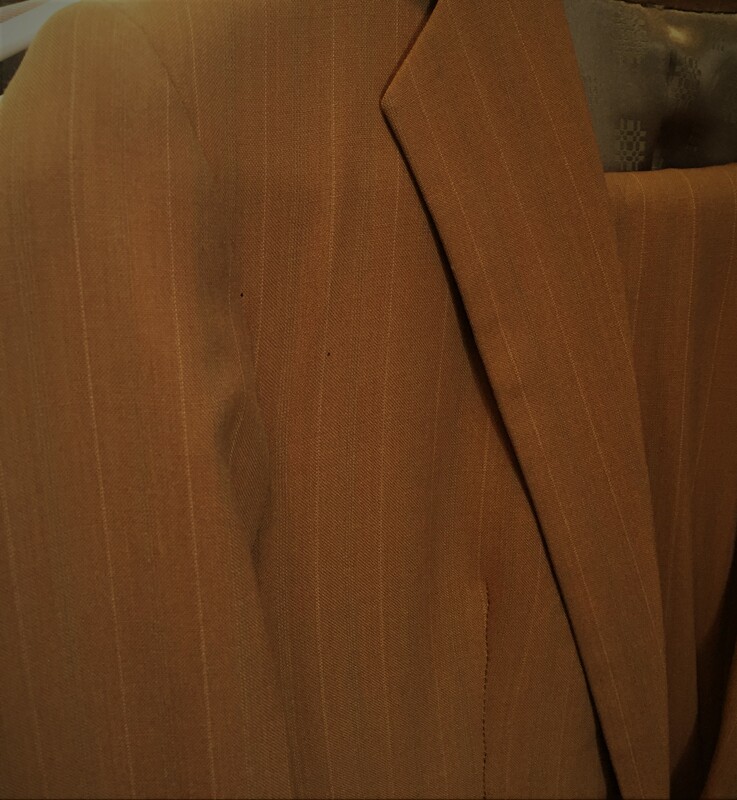 There is some minor dirt staining on back coat skirts and a small hole near edge of skirt that looks to be patched from the inside. 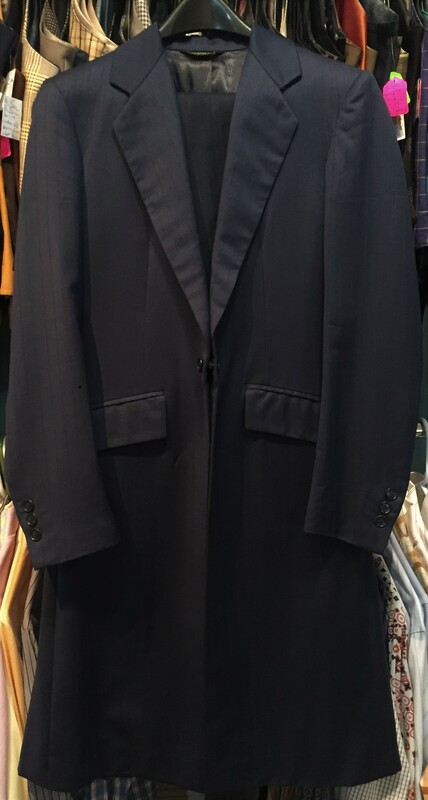 Jod Waist: 26" plus 0"
Sleeve: 24 1/4" plus 0"
Coat Length: 36 3/4" plus 0"
Jod Waist: 26" plus 1"
Inseam: 31 1/4" plus 0"
Suit does have a second pair of jods, but they have had a totally different black fabric added from ankle down. They could either be rain wear or used if you need to patch something. The good pair of jods have suede knee patches. Lining at one sleeve cuff is coming unstitched. 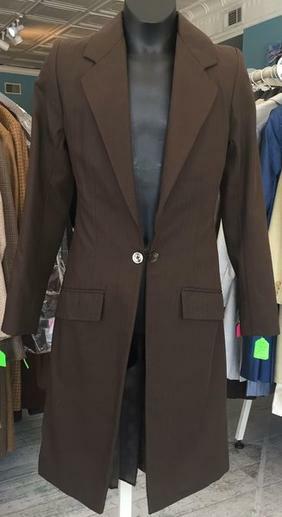 Jod Waist: 26" plus 3"
Inseam: 30 3/4" plus 1 1/2"
Sleeve: 19 3/4" plus 1"
Coat Length: 31 1/4" plus 2 1/2"
Jods have suede knee patches. 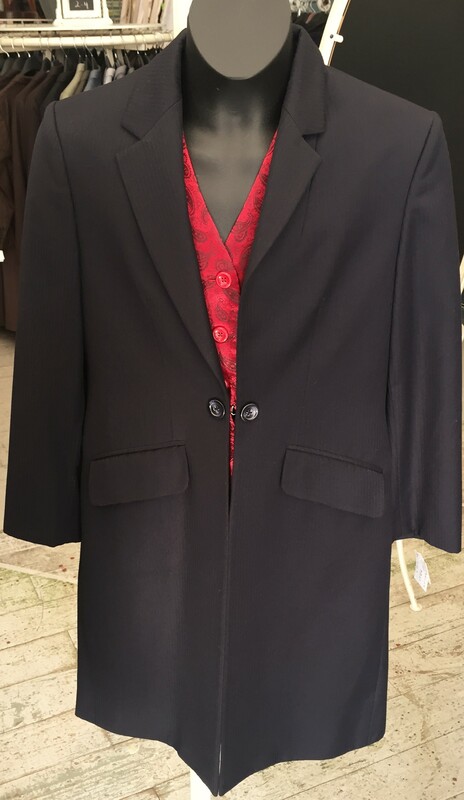 Coat has red paisley lining that matches vest. 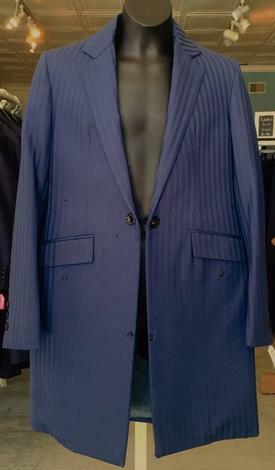 Suit is lightly used. 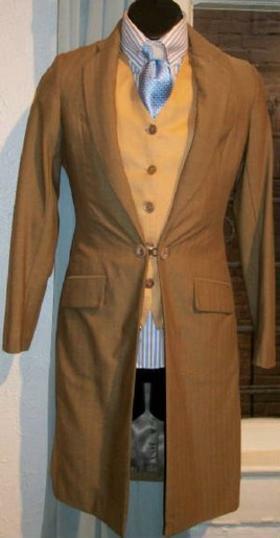 Sleeve: 18 3/4" plus 1 1/2"
Coat Length: 31 1/2" plus 1 1/2"
Jods have suede knee patches and intentional spur holes. There is some pilling of fabric on crotch. 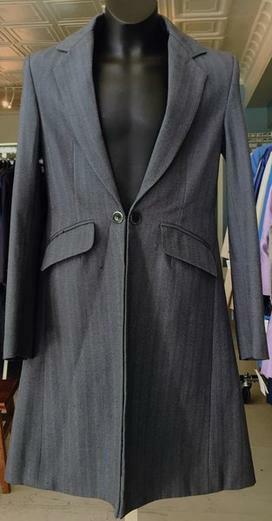 Jod Waist: 29 1/2" plus 1"
Inseam: 29" plus 2 1/2"
Sleeve: 20 1/2" plus 1 1/2"
Jod Waist: 28" plus 1 1/2"
Nape to Waist: 14 1/4"
Coat Length: 32 3/4" plus 1"
Fabric has some sheen. Jods have suede knee patches. Bells and calves have some discoloration from sweat and sadde. Each bell has a repair. 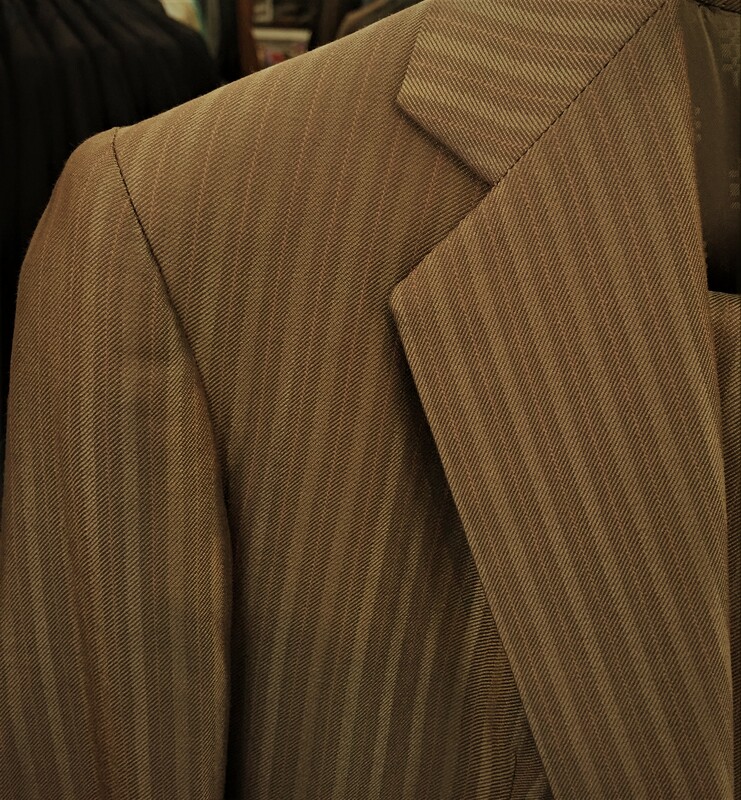 Lining on bottom of coat skirts has come unstitched in areas and skirts have some discoloration from sweat. 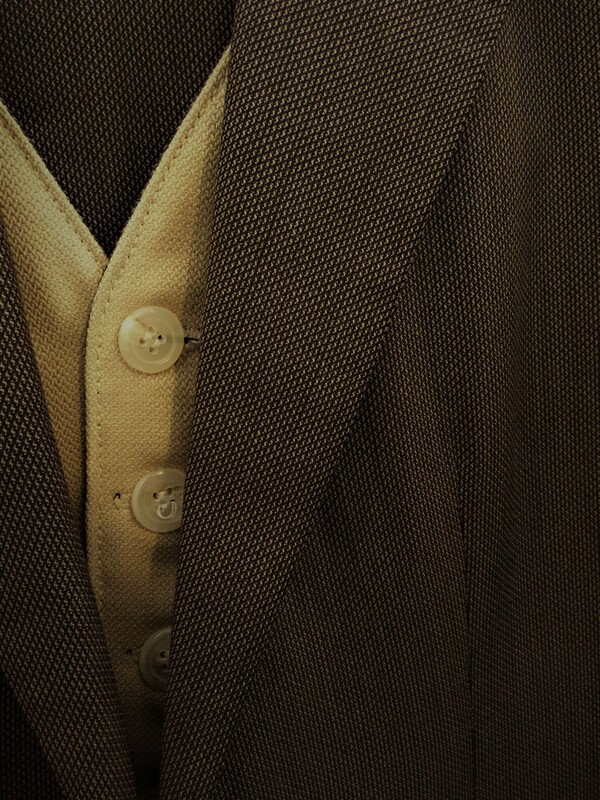 There are some nicks to fabric on back of coat from number pins. Jod Waist: 27" plus 3"
Inseam: 33 3/4" plus 1"
Sleeve: 25" plus 1 1/2"
Coat Length: 35 1/4 plus 2 1/2"
Jods made by Carlos Chavez. 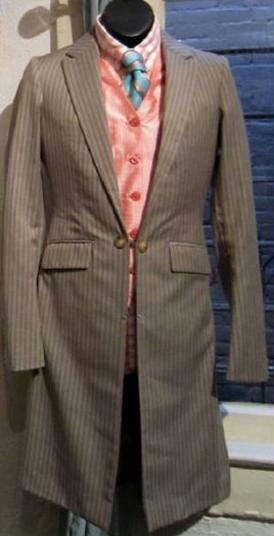 Jod Waist: 27 1/2" plus 0"
Inseam: 32 3/4" plus 0"
Coat made by Carl Meyers. 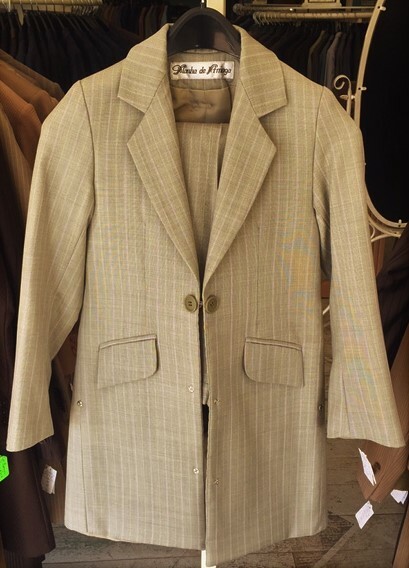 Coat Length: 35" plus 1 1/2"
Jod Waist: 25 1/2" plus 1 1/2"
Jod Waist: 29" plus 1"
Inseam: 31 3/4" plus 0"
Nape to Waist: 16 1/2"
Coat Length: 36 1/2" plus 1 1/2"
Sleeve: 22 1/4" plus 0"
Nape to Waist: 12 1/2"
Coat Length: 29 3/4" plus 0"
Inseam: 30 1/4" plus 2"
Sleeve: 20" plus 1 1/2"
Coat Length: 32" plus 1 1/2"
Jod Waist: 25" plus 1 1/2"
Sleeve: 22 1/4" plus 1"
Coat Length: 35 3/4" plus 1 1/2"
Inseam: 29 3/4" plus 1 1/2"
Coat Length: 35 1/4" plus 0"
Jod Waist: 26" plus 2'"
Inseam: 27" plus 3 1/2"
Sleeve: 19" plus 1 1/2"
Coat Length: 28" plus 4"
Jods have suede knee patches. Lightly used. 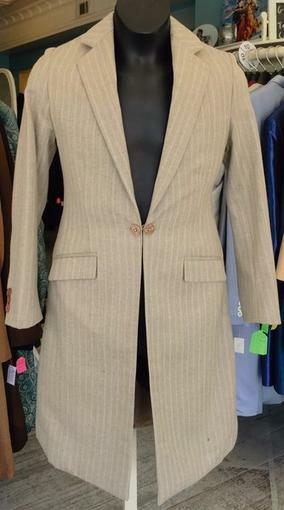 Jod Waist: 26 1/2" plus 1"
Inseam: 34 7/8" plus 3"
Sleeve: 22 3/4" plus 2"
Coat Length: 33" plus 1 1/2"
Jods have suede knee patches and intentional spur holes. Coat has snaps to hold coat skirts back and a tab to hang number from. 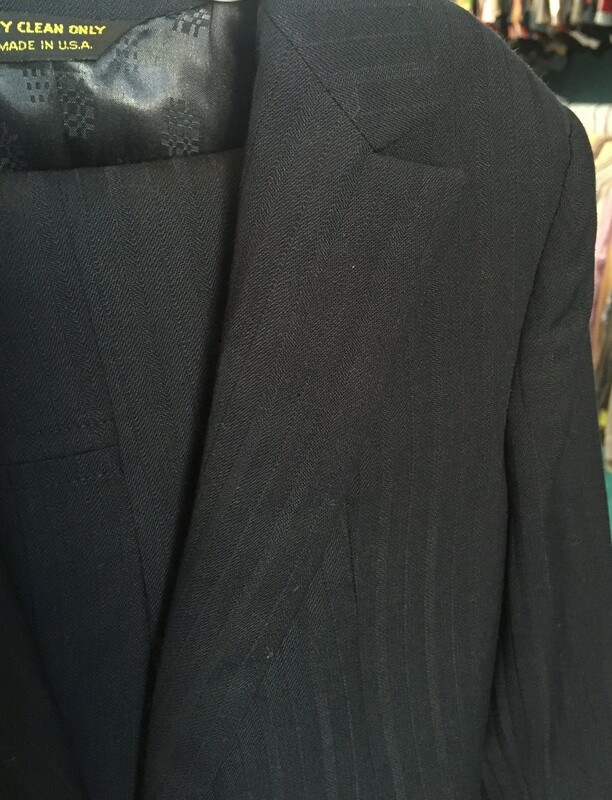 Suit was sent in dirty, has some dirt marks that should clean out. 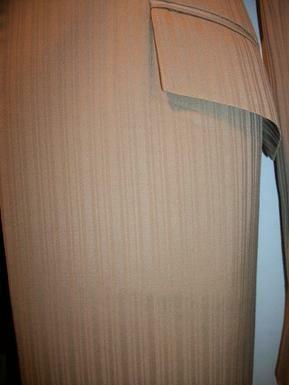 Jod Waist: 28 1/2" plus 1 12"
Marked size 12 but measures closer to size 8. Jods have suede knee patches. Bottom corner of left god pocket has started to rip. Bells have some fraying on the edge and some nicks to fabric. Lining of right arm hole has come unstitched. 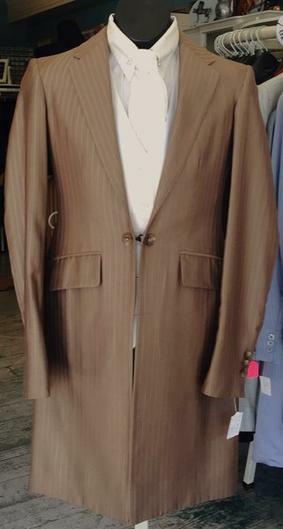 Jod Waist: 28' plus 0"
Coat Length: 32 1/4" plus 2"
Jods have suede knee patches. Crotch has been restitched and may want to be re-done. 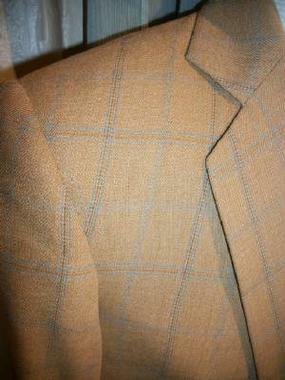 Bottom of coat lining is unstitched in small area. 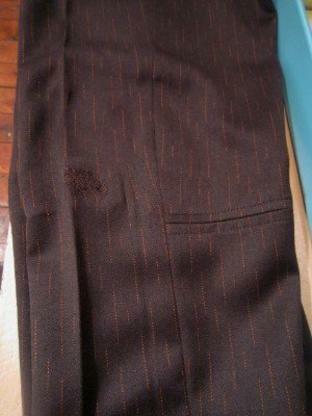 Inseam: 28 1/2" plus 0"
Coat Length: 36" plus maybe 1"
Jods have suede knee patches. Some dirt marks on both bells that may clean out. 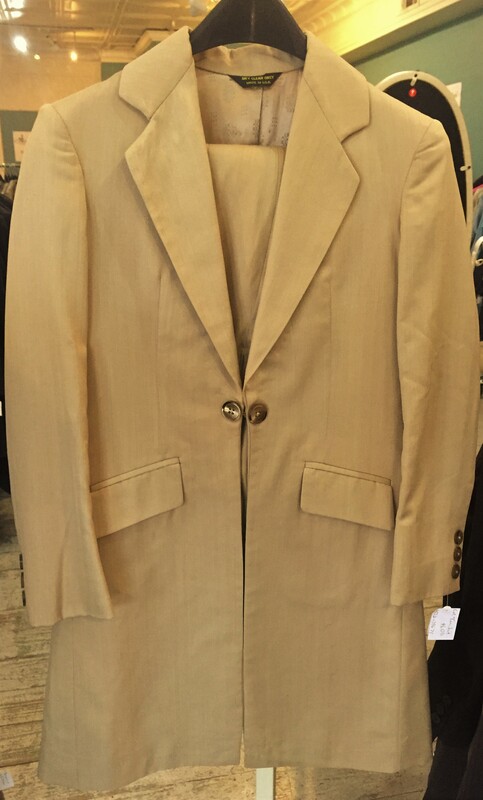 Jod Waist: 22" plus 2"
Inseam: 26 7/8" plus 2 1/2"
Coat Length: 28" plus 3 1/2"
Jods have suede knee patches. 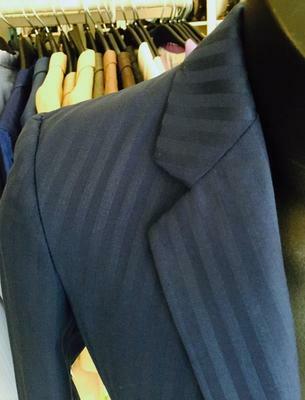 Lining down middle back seam of coat has been completely opened but can be easily restitched together. 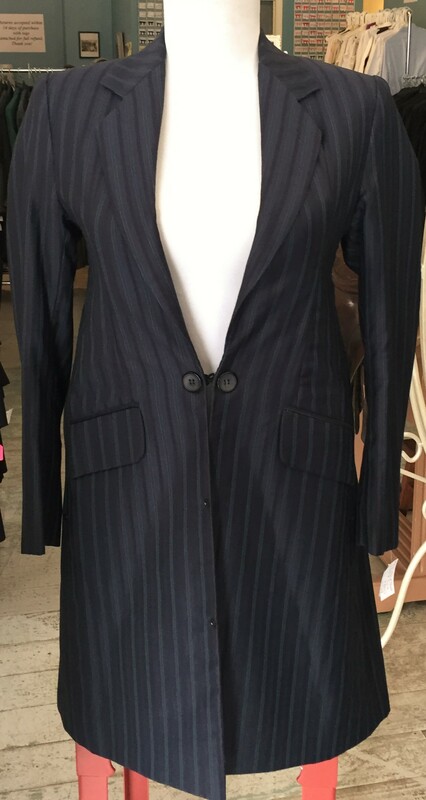 Jod Waist: 24" plus 3"
Coat Length: 30 1/4" plus 0"
Marked size 8. Jods have suede knee patches. When bells were let out, they were hemmed leaving a visible seam. 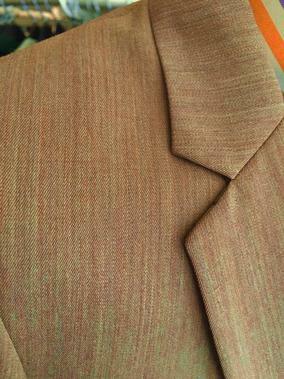 Small amount of bottom hem of coat skirt has come unstitched. Part of the DeRegnaucourt Apparel Upgrade Program. Jods have suede knee patches and intentional spur holes (and a set above that has been closed - one has ripped on the side). 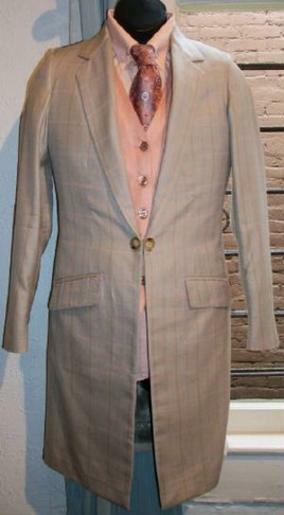 Cuff buttons have been moved and do not line up with faux button holes. 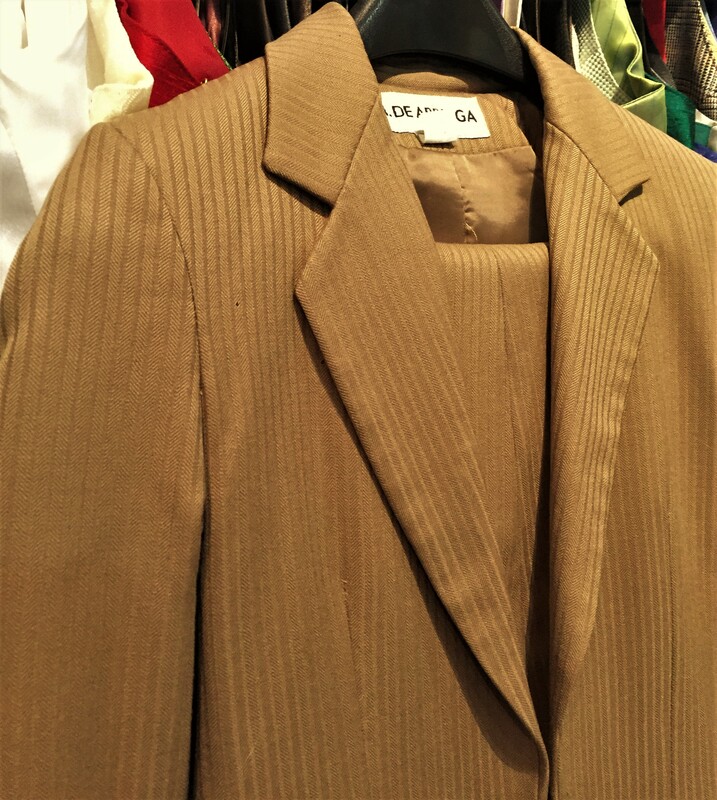 Coat Length: 31" plus 1 1/2"
Jods have suede knee patches. Each bell has a small repair, several nicks and minor fraying on edges. 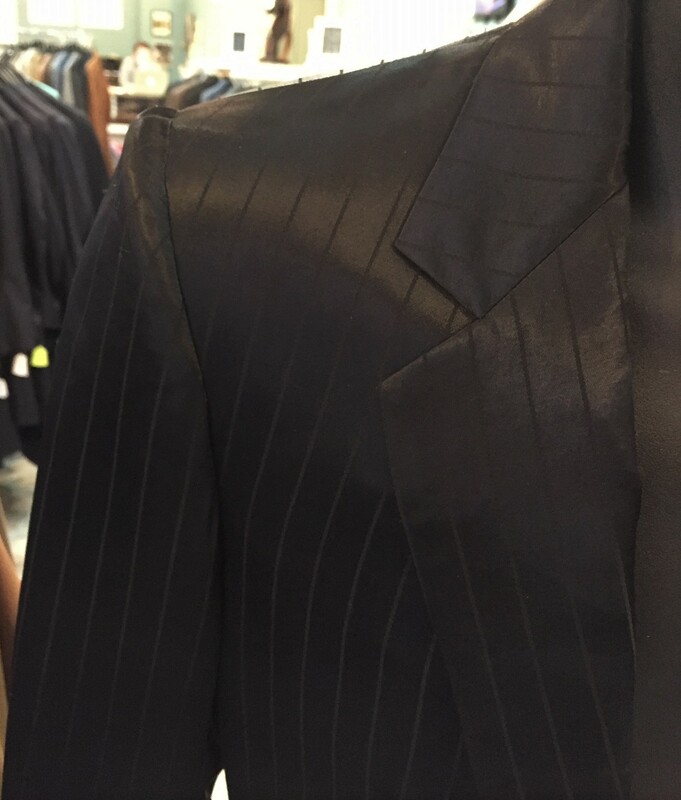 Faint sweat marks on coat skirts. 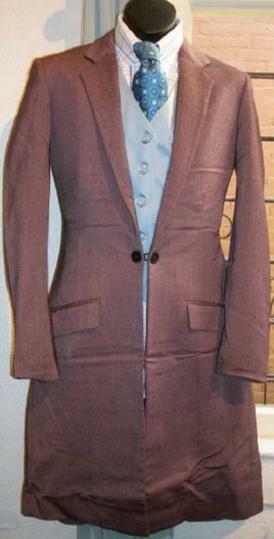 Jod Waist: 24 1/2" plus 0"
Inseam: 29 1/2" plus 0"
Coat Length: 32 1/2" plus 0"
Jods have suede knee patches and two sets of intentional spur holes that are both closed. Crotch (over 2") needs to be repaired. Hole at ankle on horse side on one leg. 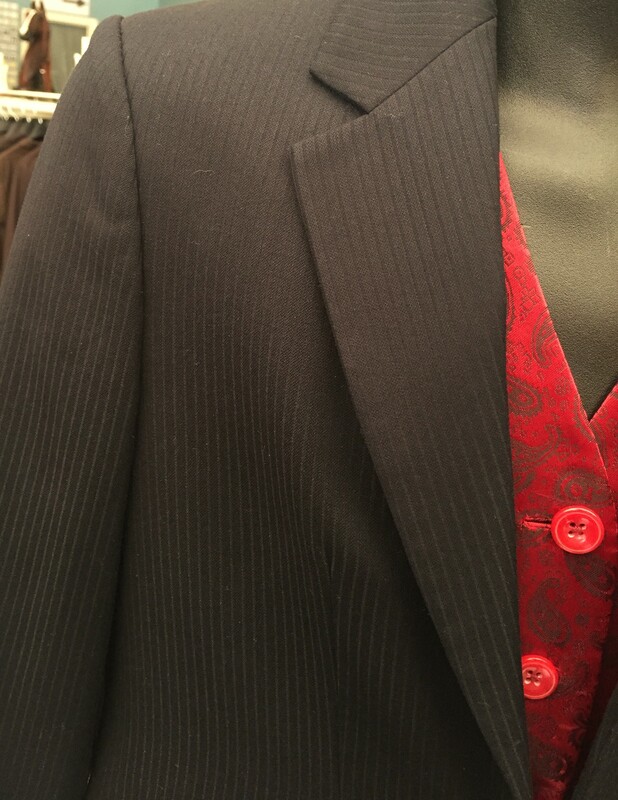 There are marks on cuffs where buttons were moved. 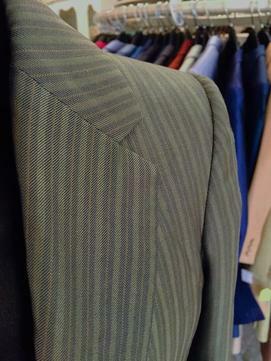 Has some faint sweat marks on back of coat skirts. 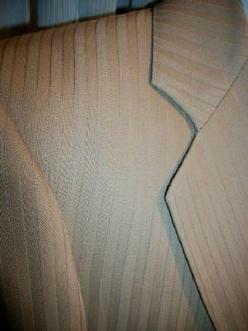 Front corners of coat skirts were rounded when length was let all the way out. 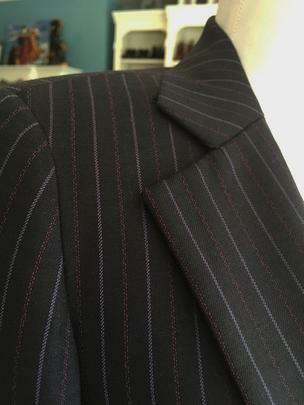 Small amount of non matching lining was added to bottom of coat skirts. 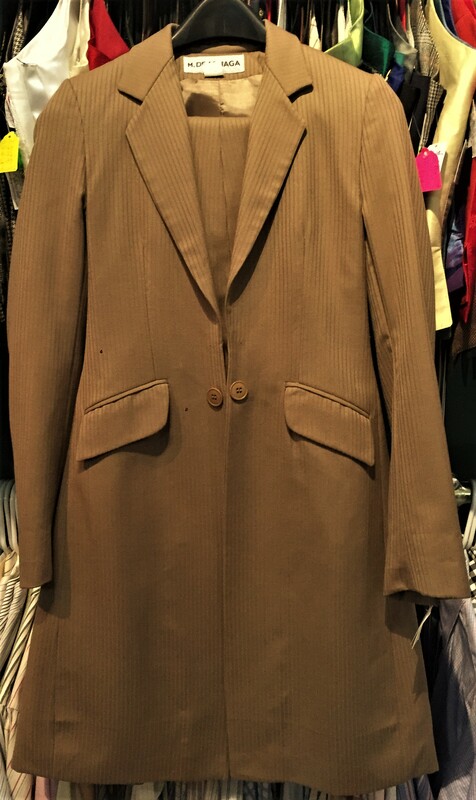 Coat Length: 34" plus 0"
Jods have suede knee patches. Bells have some nicks to fabric and dirt marks. Otherwise lightly used. Inseam: 35 1/4" plus 1"
Sleeve: 24 3/4" plus 0"
Coat Length: 36 1/2" plus 2"
Jods have suede knee patches. One bell has some fraying on edge and bells have a few nicks to fabric. 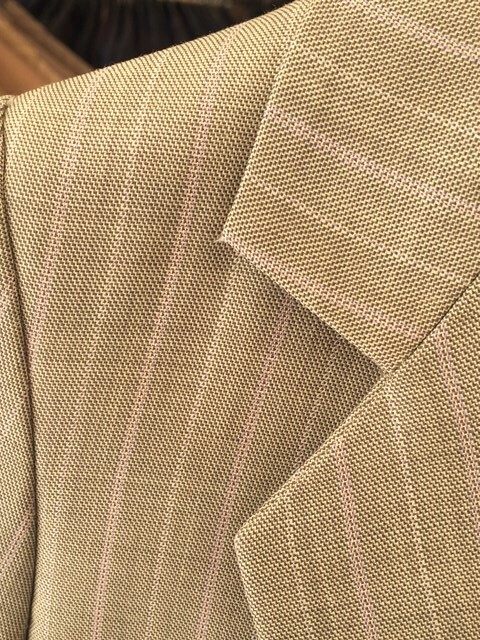 Suit has cream lining. 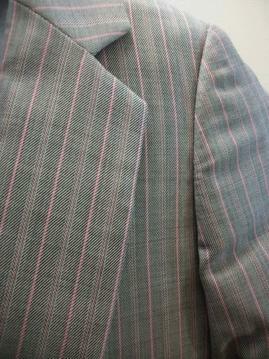 Right cuff lining has come unstitched. Otherwise lightly used. 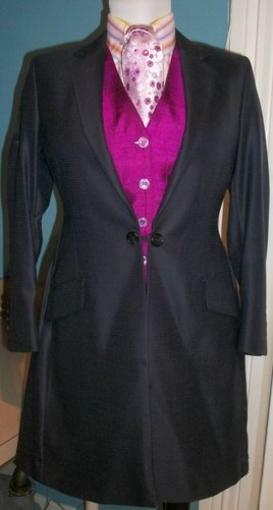 Jod Waist: 24" plus 0"
Sleeve: 22 1/4" plus 1 1/2"
Coat Length: 30 1/2" plus 1"
Jods have suede knee patches and snaps to hold coat skirts back. Bells have some rumpling from interfacing separating from fabric. Otherwise lightly used. 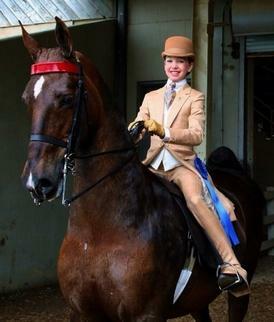 Jods have suede knee patches and snaps to hold coat skirts back. Bells have nicks to fabric and one bell seam has come unstitched on horse side about 1/2". Cuffs were hemmed nonprofessionally. 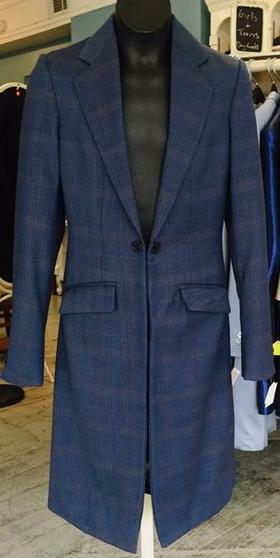 When coat length was let out there was not enough lining so a strip of non matching fabric was added. Fabric on coat has gotten a tad rumpled, possibly coming away from interfacing. 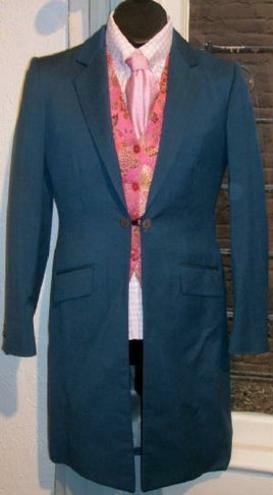 Jod Waist: 24" plus 5"
Sleeve: 22 3/4" plus 1"
Coat Length: 34 1/4" plus 0"
Jods have suede knee patches. 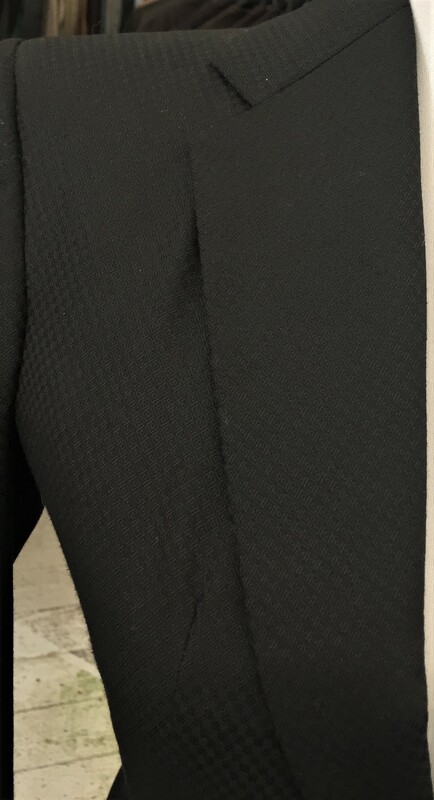 Two corners of one pocket have slightly started to rip. Jods have a few faint random, small spots. Otherwise lightly used. 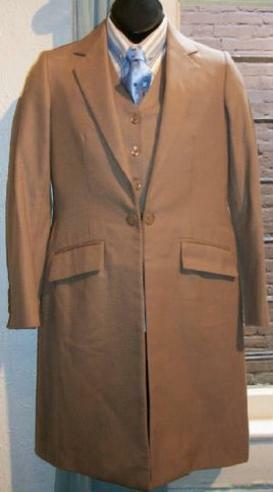 Jod Waist: 25" plus 1"
Coat Length: 32" plus 0"
Jods have suede knee patches. Bells have nicks to fabric and one has a repair. Some faint spots on bells and a couple on legs. 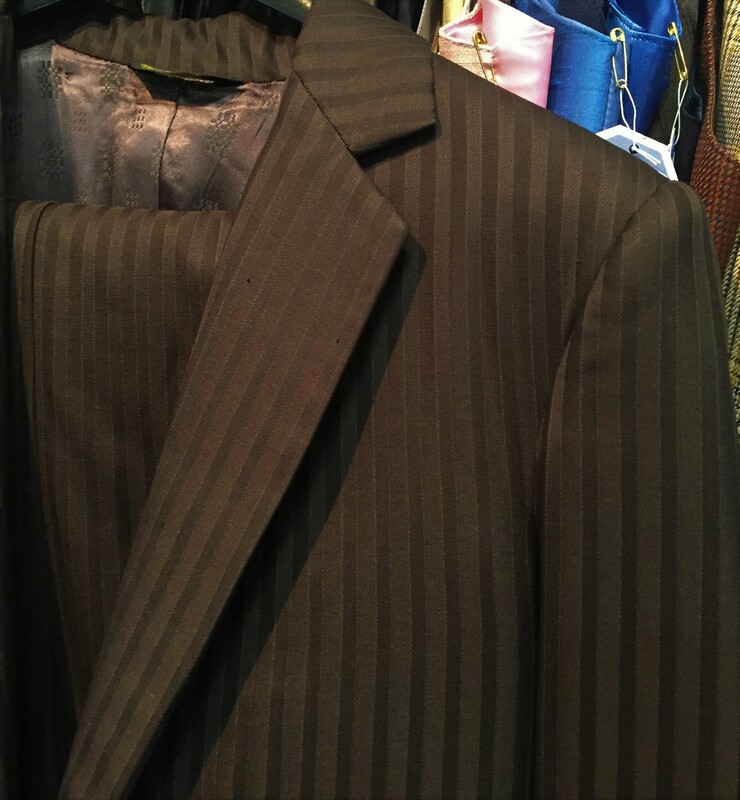 Coat has some picks to fabric and coat skirts have lines where length was let out. 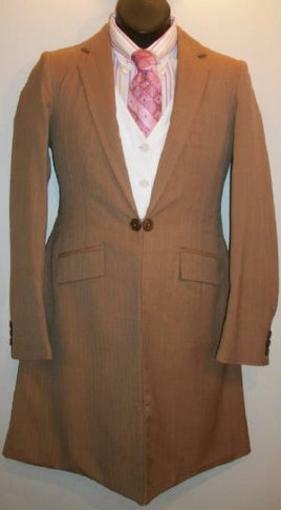 Sleeve: 18 1/2" plus 1"
Coat Length: 27 3/4" plus 0"
Jods have suede and intentional spur holes. Corner of one jod pocket has started to rip. Bells have nicks to fabric and rear middle seam was let out leaving nicks to fabric. Seam on sleeve at one underarm has come unstitched about 1/2". Inseam: 32" plus 1 1/2"
Coat Length: 33 3/4" plus 0"
Have suede knee patches and snaps to hold coat skirts back. Small repair next to zipper. One bell has a repair. Jod Waist: 28 1/2" plus 0"
Sleeve: 20 3/4" plus 0"
Coat Length: 30 1/2" plus 0"
Has suede knee patches, snaps to hold coat skirts back and a tab to hang number from. Lightly used. Jod Waist: 23" plus 2"
This fabric never photographs well. 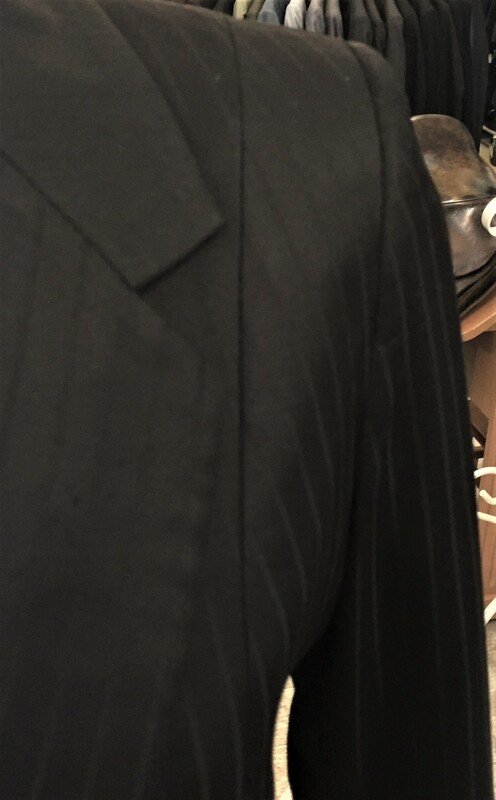 Suit has some sheen. Has suede knee patches and intentional spur holes. Bells have several repairs each and dirt lines where length was let out. Jods have several small spots. Fabric at crotch has gotten fuzzy on the outside. Right hip seam near pocket needs to be tightened. 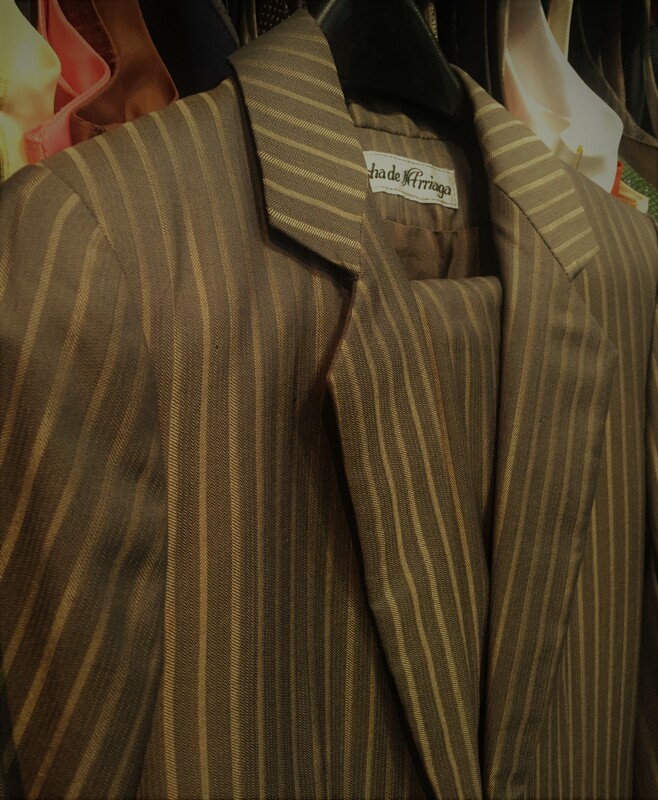 Coat length has been let out and non-matching lining fabric added. Picks where darts were before being dropped down. Jod Waist: 22 1/2" plus 4 1/2"
Sleeve: 21 1/2" plus 1 1/2"
Coat Length: 31 1/2" plus 0"
Has suede knee patches, spur holes (has some fraying) and snaps to hold coat skirts back. Bells have some nicks to fabric and have had a small square of matching fabric added when length was let out. Right armhole lining has come unstitched. 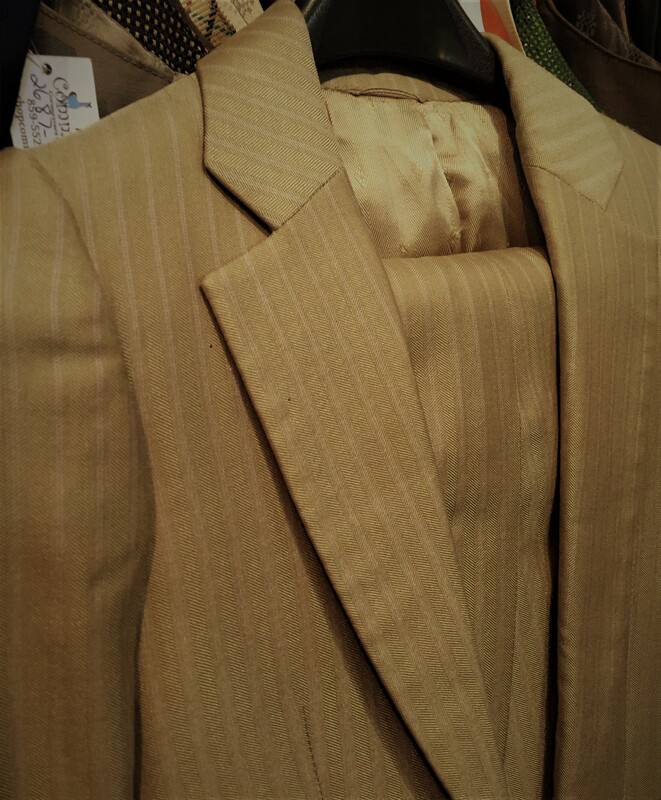 Jod Waist: 22" plus 3"
Sleeve: 21 1/2" plus 0"
Suit color in person is a tad more yellow-gold. Part of the DeRegnaucourt Apparel Upgrade Program. 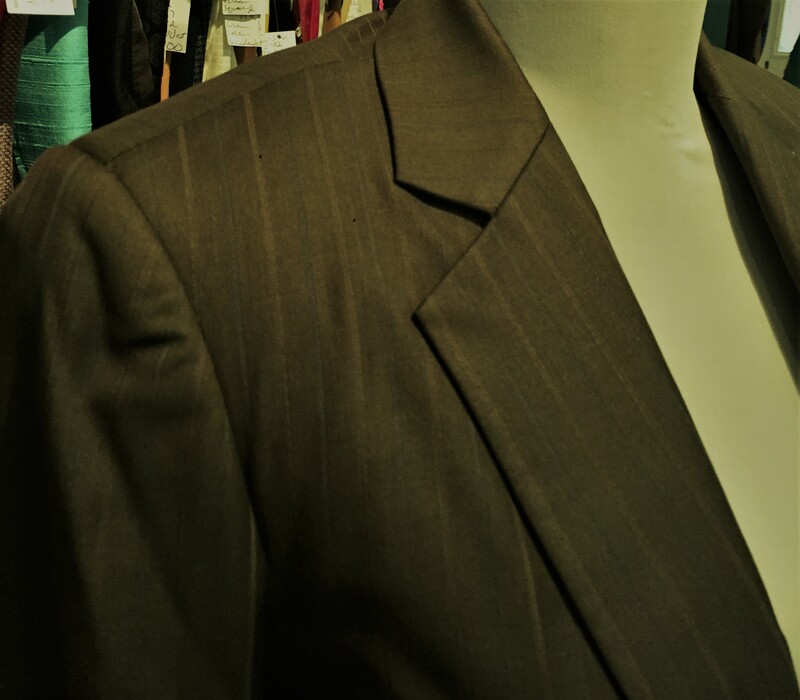 Fabric has sheen to it. Has suede knee patches and intentional spur holes. Lining of both arm holes has come unstitched. Otherwise lightly used. Jod Waist: 22 1/2" plus 3 1/2"
Inseam: 30" plus 2 1/2"
Coat Length: 30" plus 2"
Jods have suede knee patches and snaps to hold coat skirts back. Very lightly used. Jod Waist: 24" plus 1"
Inseam: 34" plus 2 1/2"
Coat Length: 32 1/4" plus 1"
Part of the DeRegnaucourt Apparel Upgrade Program. Has suede knee patches and intentional spur holes. 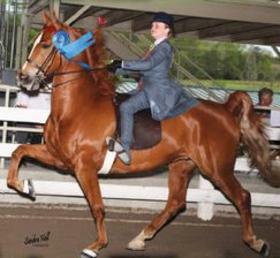 Has a few spots on bells on horse side and a spot on one knee patch. Otherwise lightly used. 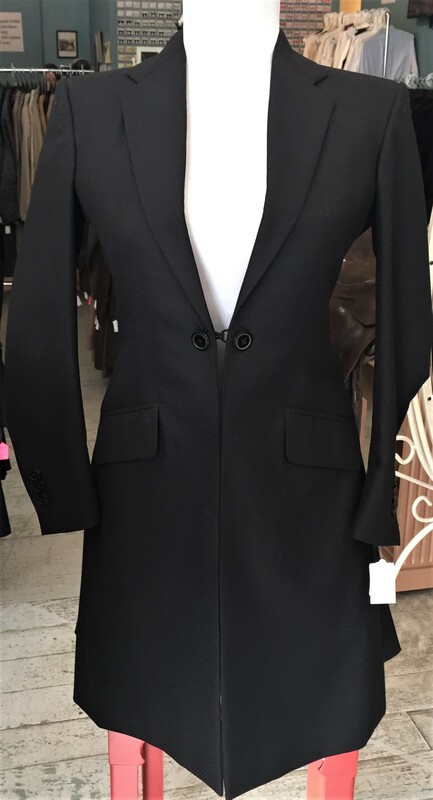 Jod Waist: 20 plus 5 1/2"
Coat Length: 27 3/4" plus 2"
Has suede knee patches that have saddle tight residue and intentional spur holes. Has dirt marks at ankle on horse side. Has snaps to hold coat skirts back. 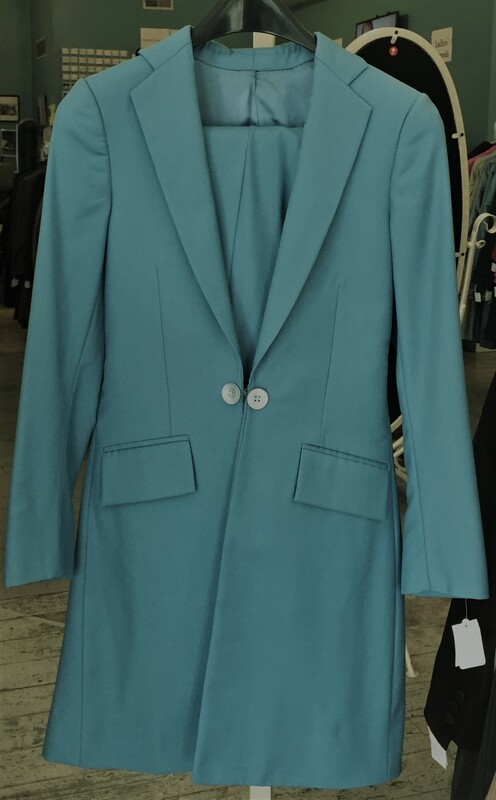 Jod Waist: 23 1/2" plus 1 1/2"
Inseam: 30 1/2" plus 1 1/2"
Sleeve: 19 1/2" plus 1 1/2"
Coat Length: 29 1/2" plus 1 1/2"
Fabric has sheen to it. Has suede knee patches and intentional spur holes. 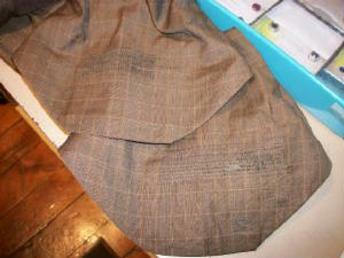 Middle vent lining has come unstitched and a small amount of lining has come unstitched on bottom of coat skirt. Otherwise lightly used. 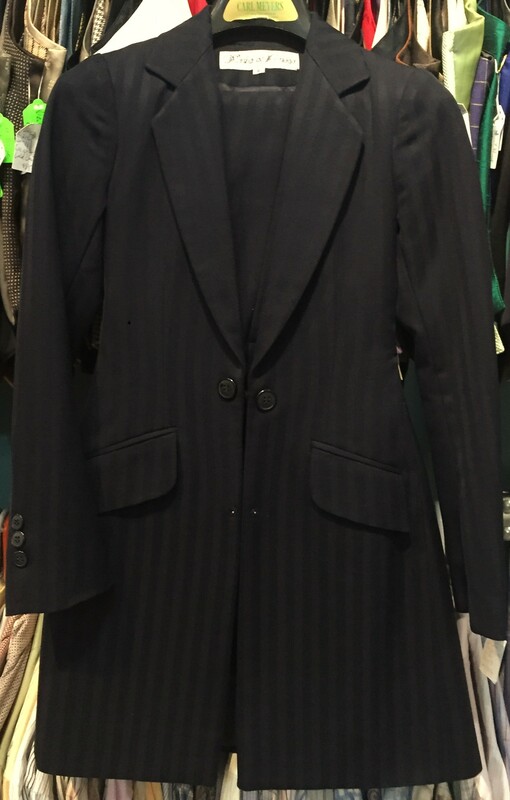 Jod Waist: 24" plus 4"
Inseam: 27 1/2" plus 3"
Sleeve: 19 3/4" plus 1 1/2"
Coat Length: 28 1/4" plus 2"
Suit has some sheen to it. 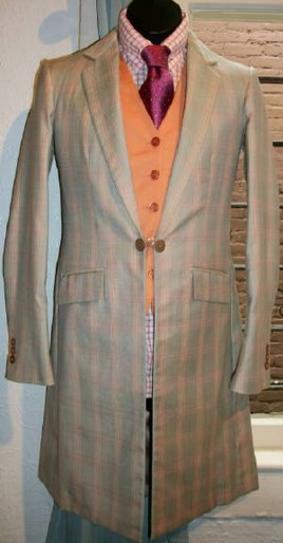 Jod One: Was made at the same time as the coat. Has suede knee patches and intentional spur holes. Each bell has a couple repairs and one repair has split. Faint spot on side of left knee. One suede knee patch has a spot. Faint dirt marks on horse side ankles and bells. Jod Waist: 22" plus 3 1/2"
Jod Two: Jods have suede knee patches and intentional spur holes. Faint dirt marks on calf and ankle on horse side along with imperfections to fabric on inside calf. Beginning of hole on horse side of ankle. 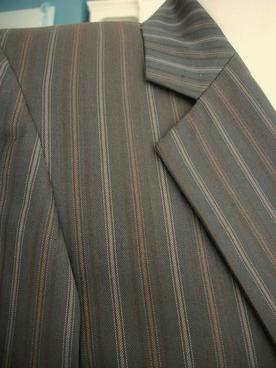 Coat: Lining has come unstitched on bottom of coat skirts. 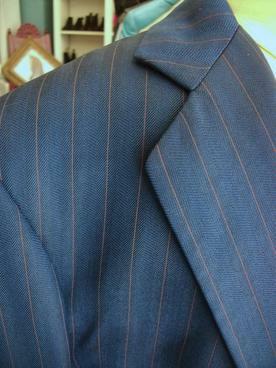 Length has been let out and non-matching lining has been filled in. 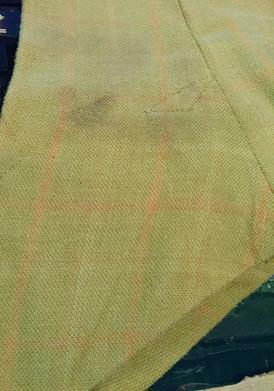 Fabric squares on front bottom corners of coat skirts have been added where there was not enough fabric when length let out. 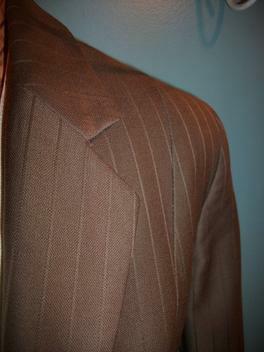 Dirt line visible also from coat length being let out. 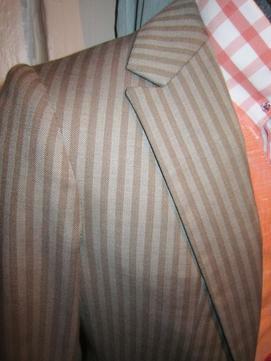 Lines on sleeve cuffs where buttons were originally. 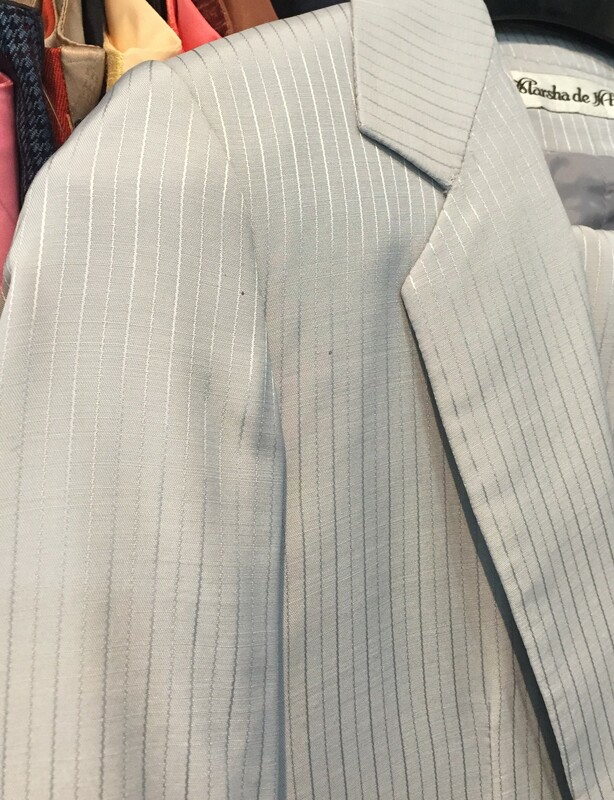 Faint sweat marks and some random nicks to fabric. 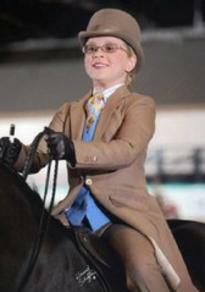 Coat Length: 29 1/2" plus 0"
Jods have suede knee patches and intentional spur holes. A second set of spur holes has been closed. Each bell has a couple repairs. Nicks on cuffs where sleeve buttons were moved. 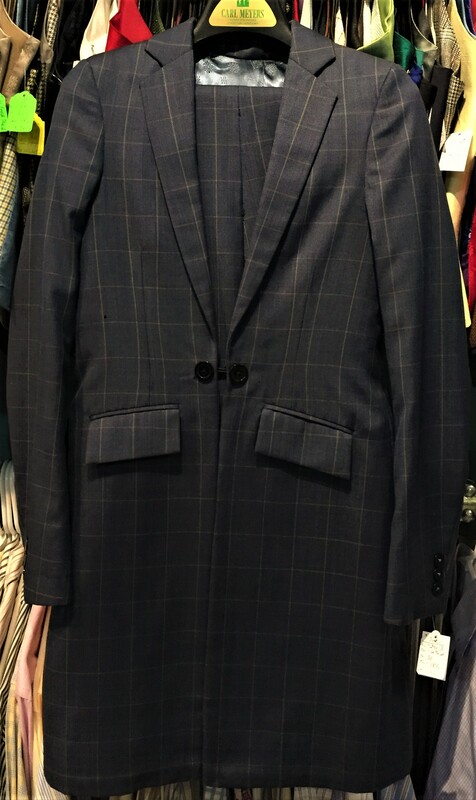 Jod Waist: 23 1/2" plus 0"
Nape to Waist: 13 3/4"
Coat Length: 29 7/8" plus 2 1/2"
Part of the DeRegnaucourt Apparel Upgrade Program. Fabric has some sheen. Jods have suede knee patches and intentional spur holes. Left knee has square repair on front. Few nicks to fabric near left calf where seam las let out. 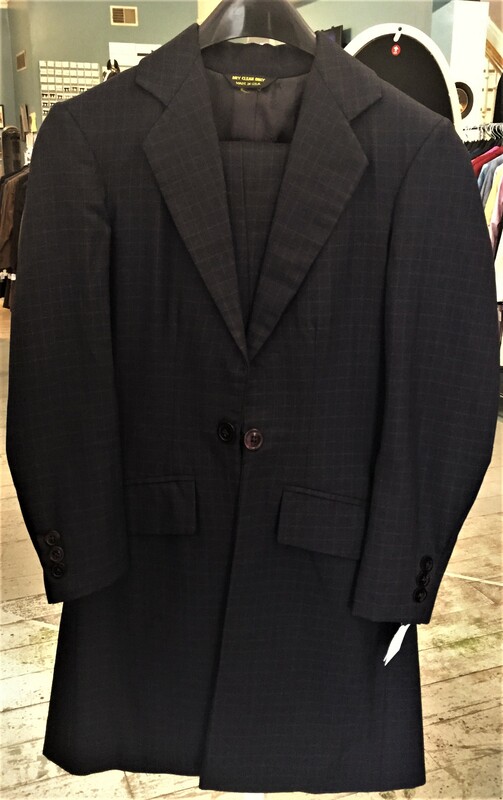 Jod Waist: 22 1/2" plus 3"
Coat Length: 30" plus 4"
Jods have suede knee patches and spur holes that have been closed/repaired. Nicks to fabric on jod bells and rumpling where fabric has separated from interfacing. Front of bells have a seam where about 1" of fabric was added fro additional length. 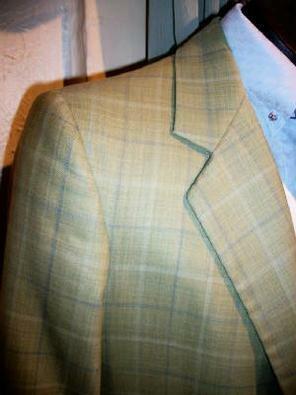 Some nicks to coat fabric, faint sweat marks and small hole on edge of one coat skirt. 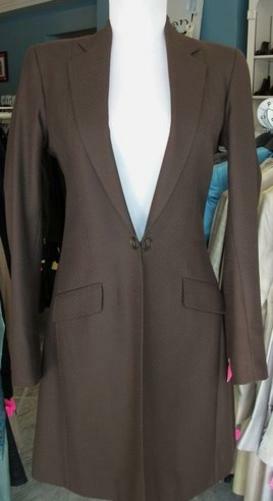 Jod Waist: 24" plus 3 1/2"
Sleeve: 21" plus 1 1/2"
Coat Length: 31 1/4" plus 0"
Jods have suede knee patches. Jods have some nicks and small repairs, right bell has small hole and rear seam (about 1 1/2") needs restitched. 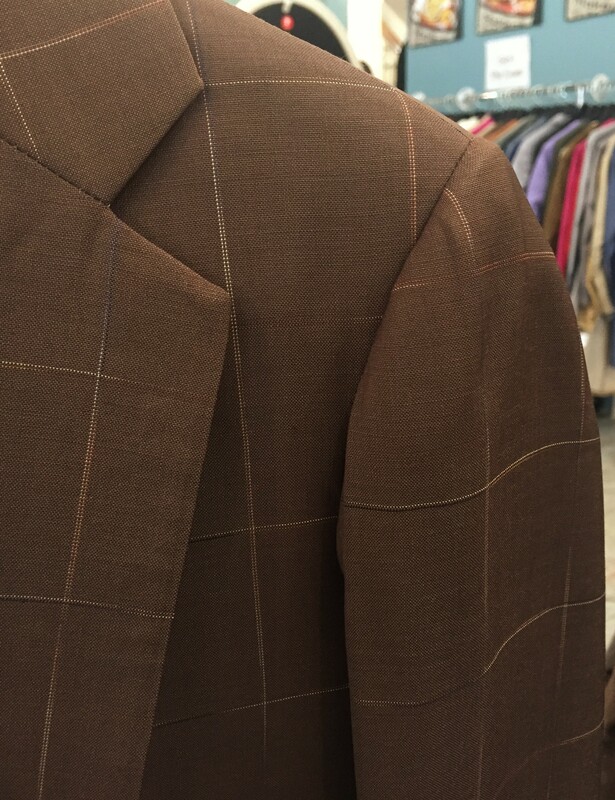 Sleeve: 19 78" plus 0"
Coat Length: 29" plus 0"
Suit has a touch more sage tone in person than photos show. Jods have suede knee patches and spur holes that have been cut in (not professionally). 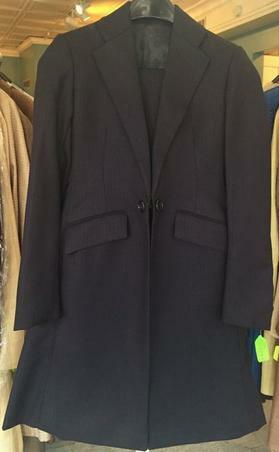 Coat has snaps to hold coat skirts back and a tab to hang number from. Jods have some random spots and bells have nicks. 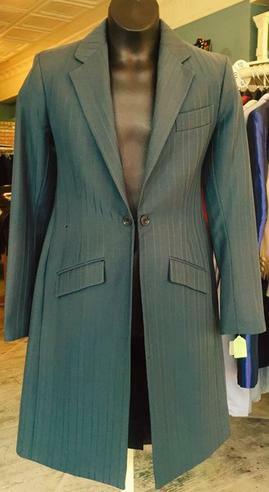 Jod Waist: 22" plus 0"
Inseam: 23 1/2" plus 1 1/2"
Sleeve: 17 1/2" plus 0"
Coat Length: 25 1/4" plus 0"
Suit has a touch of green to the teal in person. 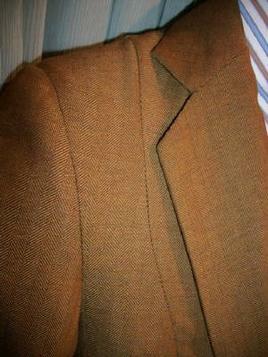 Jods have suede knee patches and coat has snaps to hold coat back. Jod ankles and bells have dirt marks mainly on horse side. Each bell has several repairs and one bell has a small patch on the outside. 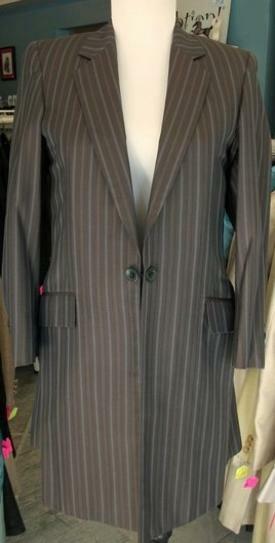 Jod Waist: 22 1/2" plus 0"
Sleeve: 19 7/8" plus 1"
Coat Length: 28 1/4" plus 1"
Marked size 6, measures small. 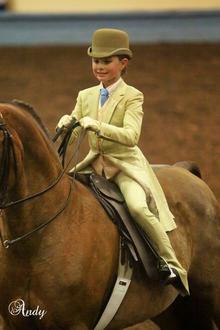 Jods have suede knee patches and coat has snaps to hold coat skirts back. Both bells have a repair and some nicks to bells. When length of jods was let out, bells were finished with a stitch. 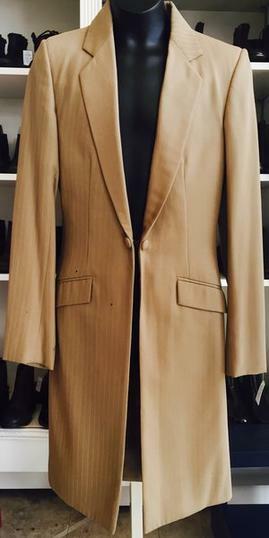 Inseam: 26 7/8" plus 0"
Sleeve: 20 1/4" plus 0"
Nape to Waist: 12 1/4"
Coat Length: 28" plus 1 1/2"
Jods have suede knee patches. Has faint dirt stains on ankles at horse side. Coat has snaps to hold coat skirts back. Jod Waist: 21" plus 2 1/2"
Sleeve: 21 1/4" plus 1 1/2"
Jods have suede knee patches. Dirt line on bells of jods where hem was let out and dirt at ankles on horse side. Front rise also has some dirt marks. Coat has snaps to hold coat skirts back. 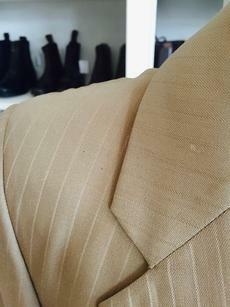 Dirt line on bottom of coat skirts and cuffs where hem was let out. 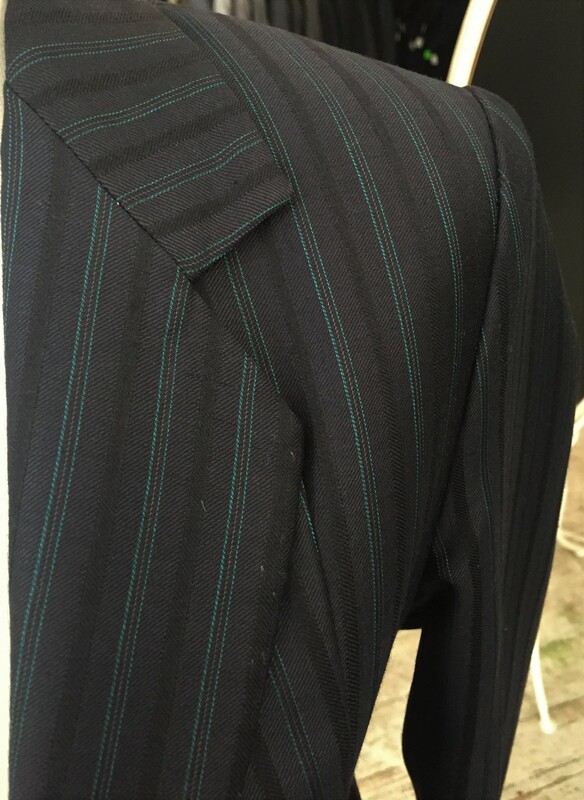 Jod Waist: 25" plus 21/2"
Suit is almost black. Jods have suede knee patches. 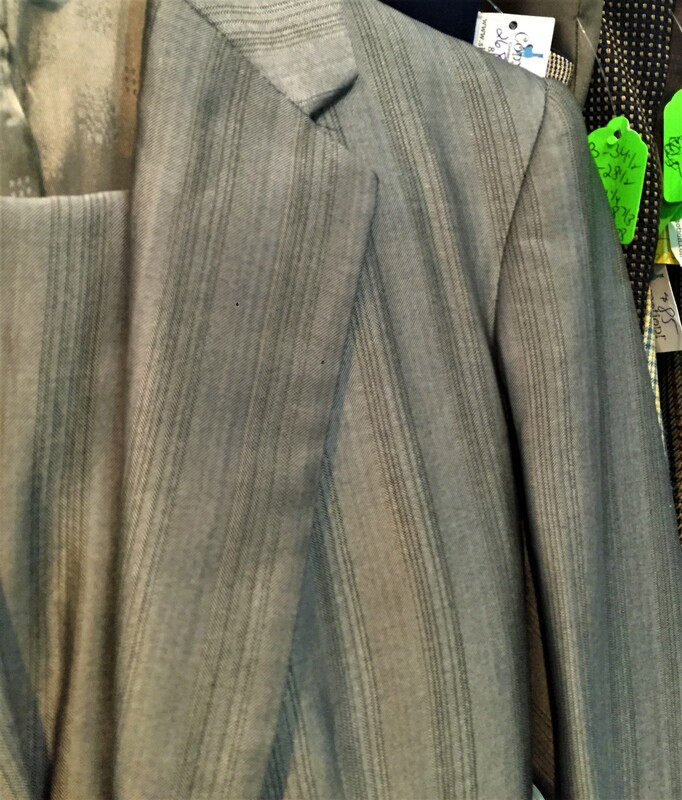 Great suit for lead line. Very lightly used. 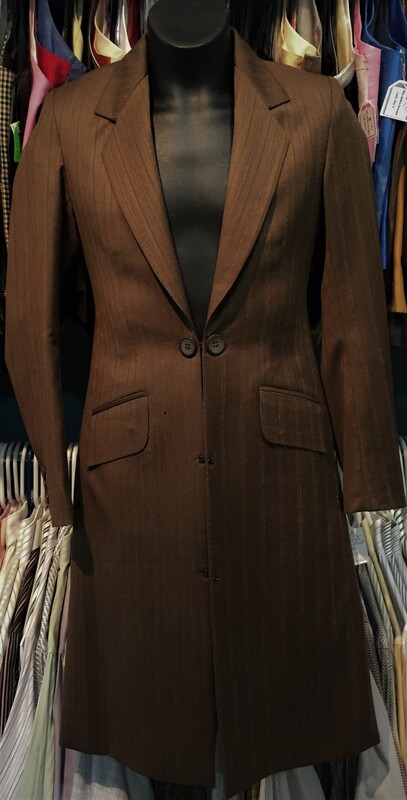 Jod Waist: 19" plus 2"
Inseam: 21 3/4" plus 2"
Sleeve: 14 1/2" plus 1 1/2"
Nape to Waist: 10 1/2"
Coat Length: 22" plus 2"
Jods have suede knee patches and a 1 1/2" panel that has been added just to waistband. Jods have been let out on seam down both legs, leaving some nicks/tiny holes especially down the right leg. Both bells have some nicks and minor fraying. Coat has snaps to hold skirts back and tab to hang number from. 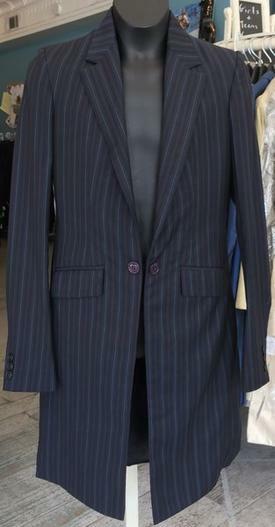 Suit is marked Stock Size 10. Jods have suede knee patches There are a few minor nicks on coat from number pins and pins used to hold skirts back. 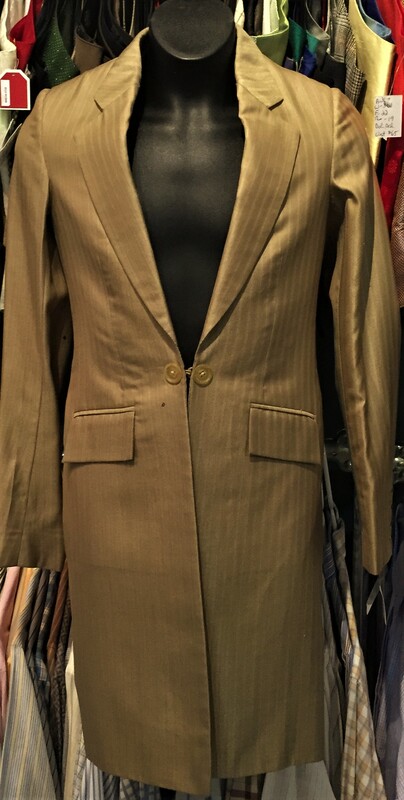 Jod Waist: 26" plus 1 1/2"
Sleeve: 21 3/4" plus 2"
Suit is very lightly used with suede knee patches. Coat has snaps to hold skirts back. Jod Waist: 27" plus 1"
Jods have suede knee patches and Velcro inside bells to keep from dragging. No real flaws to suit. Inseam: 28 1/2" plus 2 1/2"
Jods do not have suede. Bells have nicks to fabric and each has a repaired area. One has the start of another rip where fabric has started to separate. 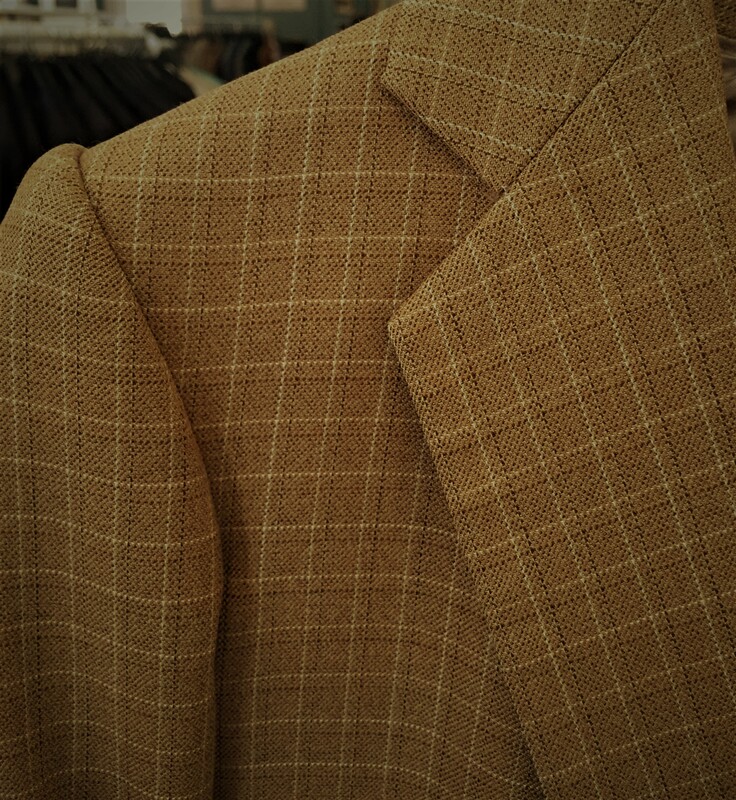 Middle vent lining of coat has come unstitched. 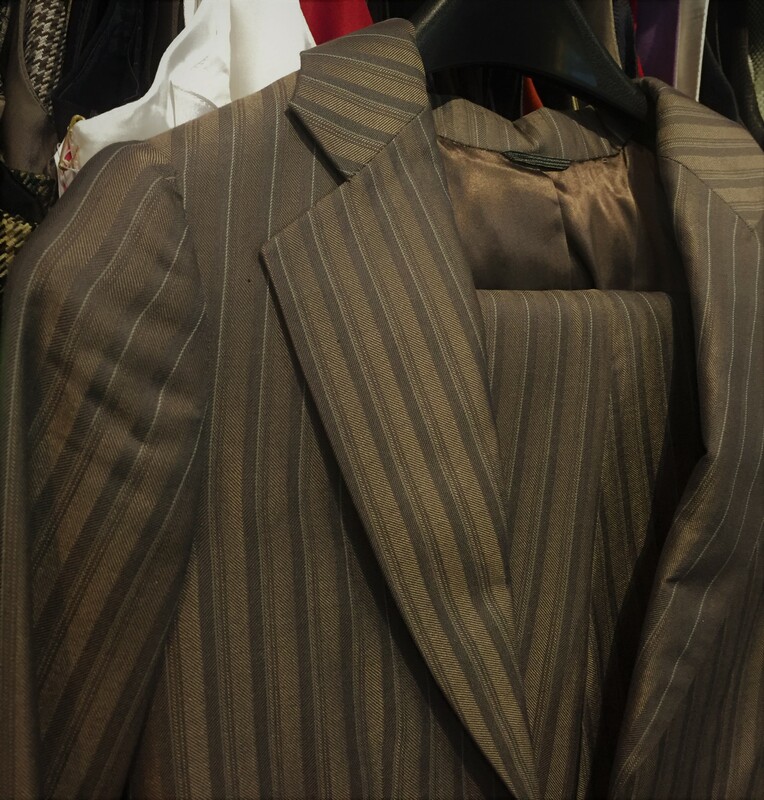 Coat has a few minor nicks to fabric on front of coat skirts that would be hiddlen when pinned back. Marked Size 8, measures a little small. Jods have suede knee patches. One front pocket has ripped a tad on bottom. 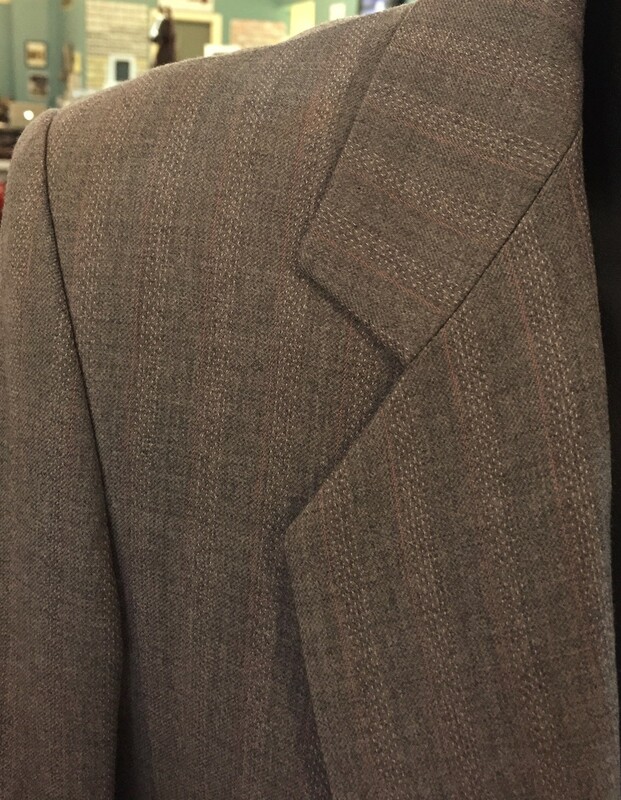 Coat has a couple tiny nicks that were left when buttons were moved down. Jod Waist: 23" plus 3"
Nape to Waist: 14" darts were lowered, could be raised back to about 12 1/2"
Length: 31 3/4" plus 1"
Has suede knee patches. Both bells have repairs and have been hemmed sloppily. Two pocket corners have started to rip. Panels have been added to horse side of bells to make them wider. One panel is ripped. 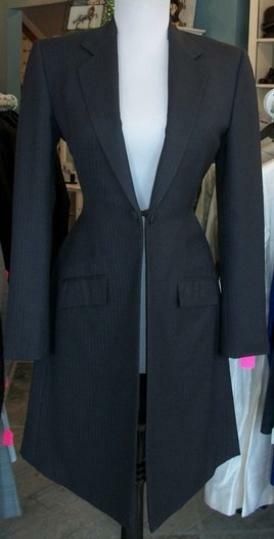 Coat has snaps to hold skirt back. 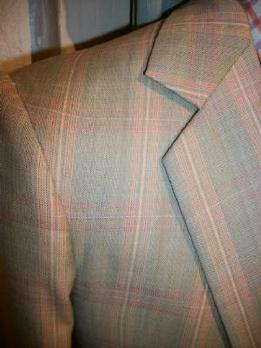 Has one nick to fabric on back. Jods have suede knee patches and a seam that runs down back of bells (click photo for a closer look). 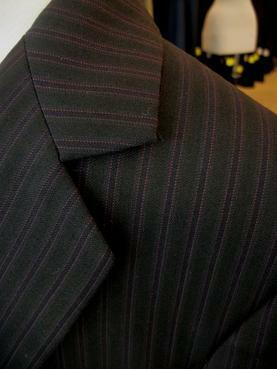 Jods have small hole near bottom of zipper and a few inches below that is about an inch of seam that has come unstitched. Bells have nicks to fabric and one bell has small patched (from inside) hole. 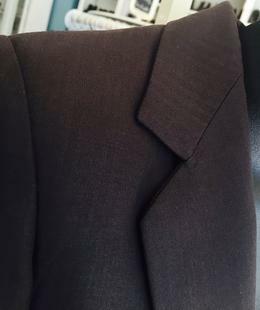 One coat sleeve has a loose cuff button and other sleeve has a broken button. 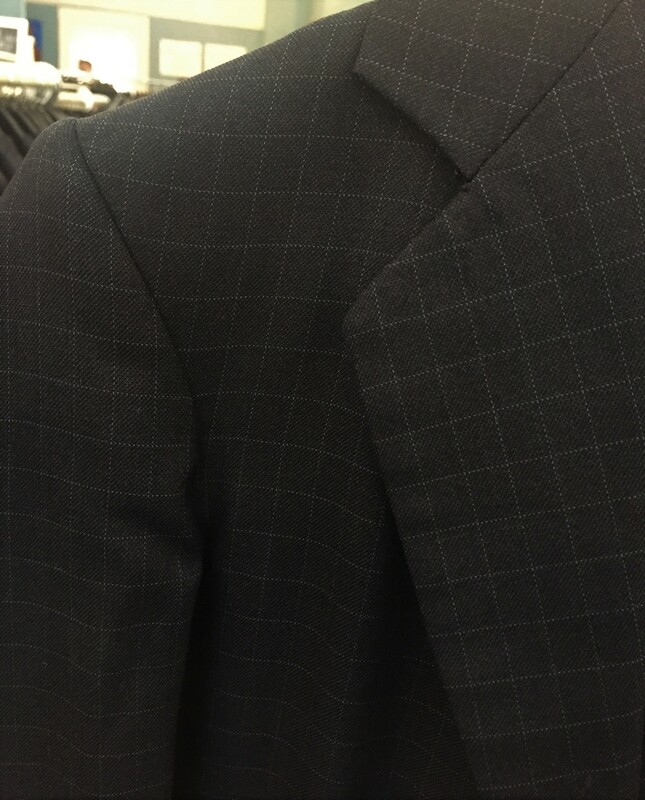 (Spots on coat in photo are from camera, not there in person). 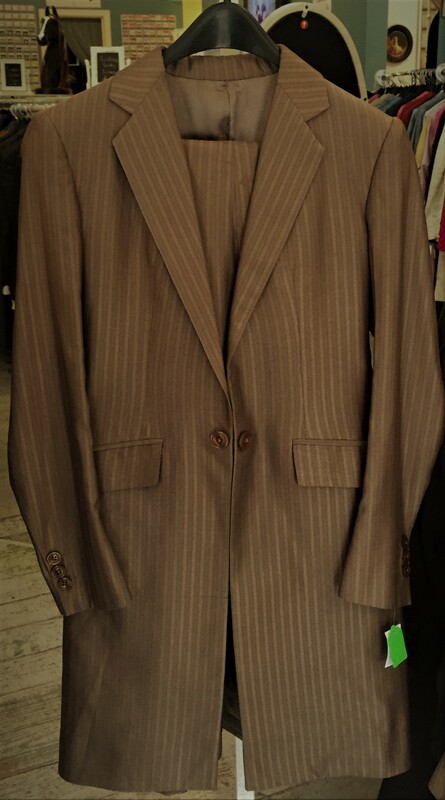 Suit is lightly used with suede knee patches. Jod waistband back seam has been unstitched about an inch for more room. 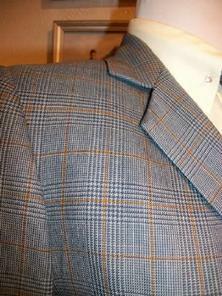 Has a few very minor nicks to fabric on coat. Jod Waist: 22" plus 1 1/2"
Inseam: 30 1/4" plus 1"
Sleeve: 21 3/4" plus 1 1/2"
Length: 28 3/4" plus 2 1/2"
Jods have suede knee patches. One intentional spur holes has ripped and same bell also has small rip where inside tie down buttons attach. 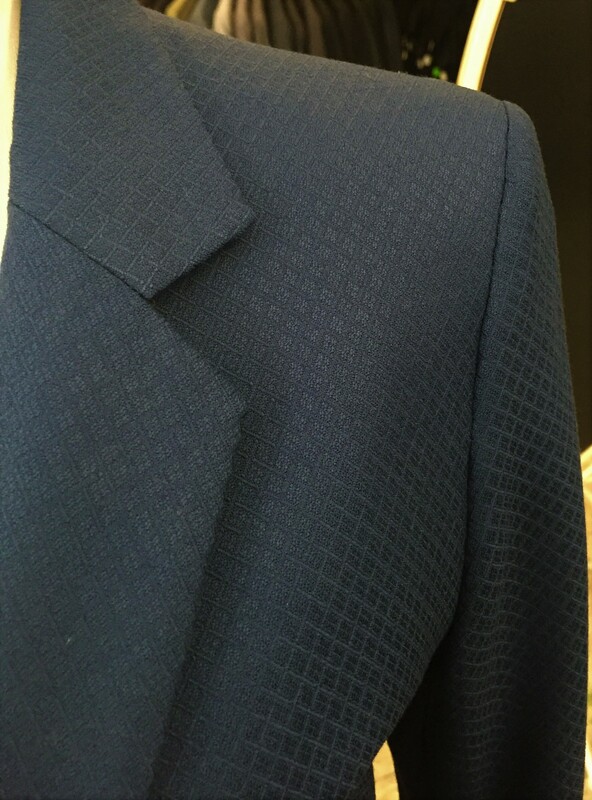 Coat has some pin marks from lapel pin. 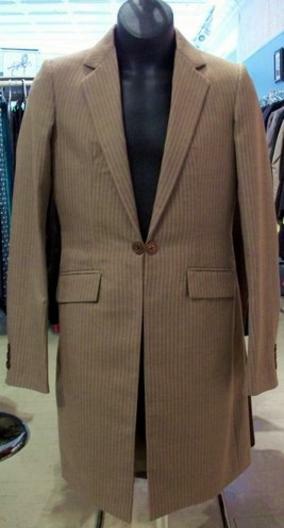 Suit is lightly used with suede knee patches that start at crotch. Jods have suede knee patches and intentional spur holes. Has suede knee patches and intentional spur holes. Jod bells have a few nicks to fabric. Fabric has a slight texture to it. 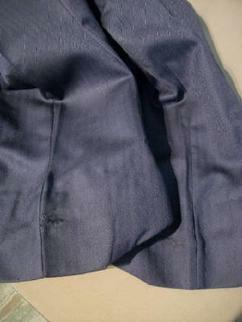 Jods have suede knee patches and suede seat that do not connect and intentional spur holes. Suede has a few places of pink spots but these will not show on the horse. One bell has one small hole that has been patched from the inside. 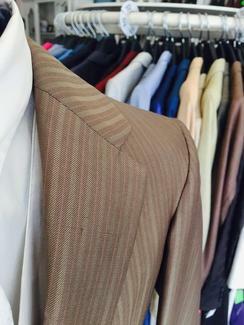 There are a few minor nicks to fabric at sleeve cuffs left when length was let out. 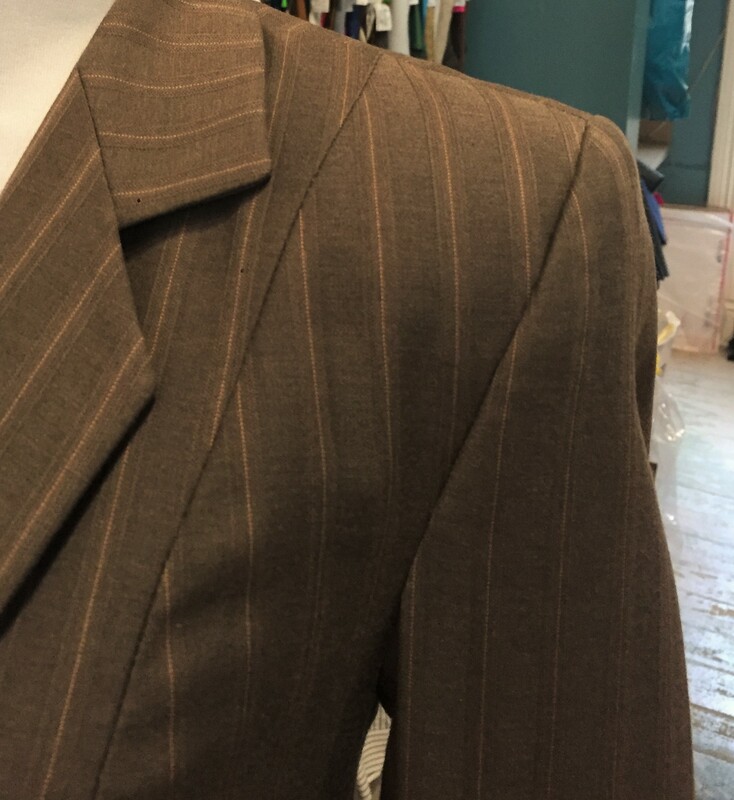 Inseam: 29 1/2" plus 1"
Length: 31 1/2" plus 1"
Suit is very lightly used with suede knee patches and intentional spur holes. 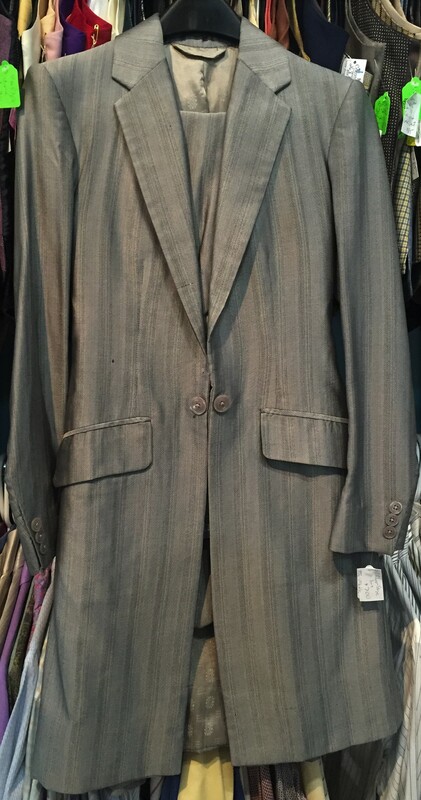 Suit was very lightly used and has suede knee patches and intentional spur holes. 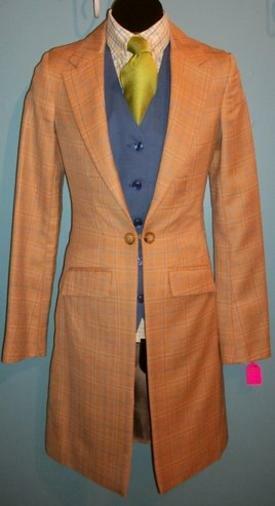 Coat has snaps to keep coat skirts back and each cuff has one button that is missing it's cover. 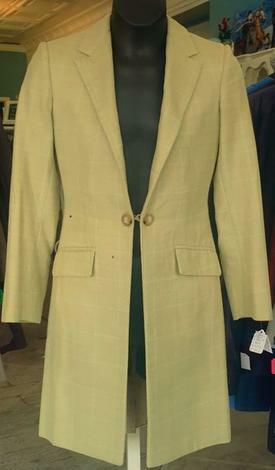 Very lightly used with suede knee patches and snaps to hold coat skirts back. Has suede knee patches. Has a tiny hole in the crotch and start of hole on one ankle. Seam on horse side of one bell has come unstitched an inch. Coat has snaps to hold skirt back. 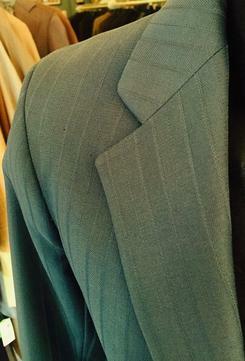 Middle vent lining of coat could be restitched. 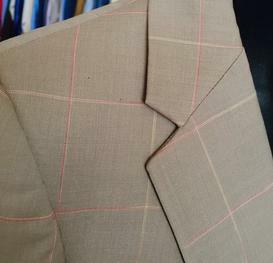 Eye of coat closure is loose and there are some nicks to fabric next to back darts. Jods have suede knee patches and intentional spur holes. Bells have a couple small holes that have been patched from inside, some pilling of fabric at ankles and some ground in dirt staining at ankles on horse side. 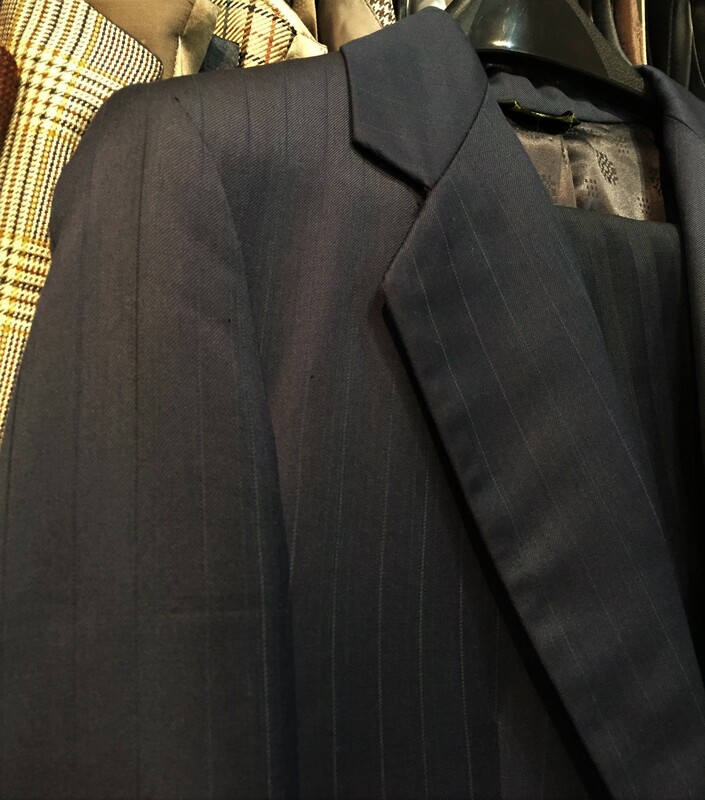 Sleeves were shortened by local tailor and are a tad uneven at cuffs. 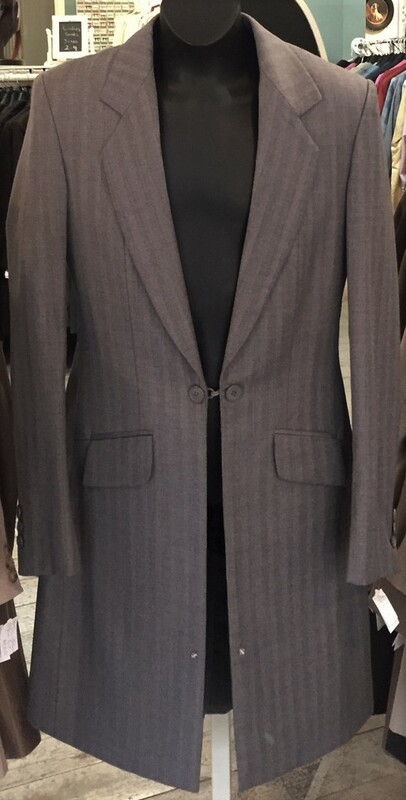 Suit is part of the DeRegnaucourt apparel upgrade program. It is very lightly used with suede knee patches and intentional spur holes. 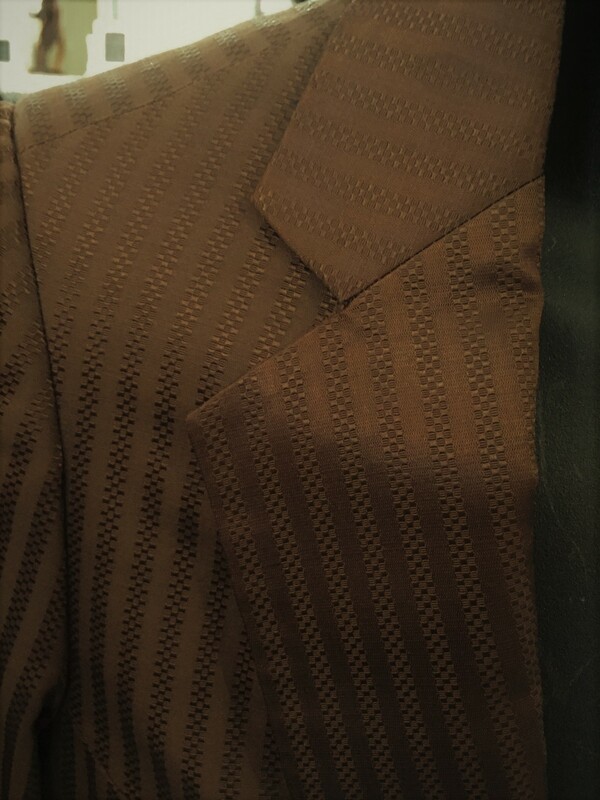 Buttons were moved on sleeve leaving marks where they previously were. Lightly used with suede knee patches and intentional spur holes that are still closed. Has 1" wide vertical panel added to crotch for more room. Coat has snaps to keep skirts back. Suit was never worn. 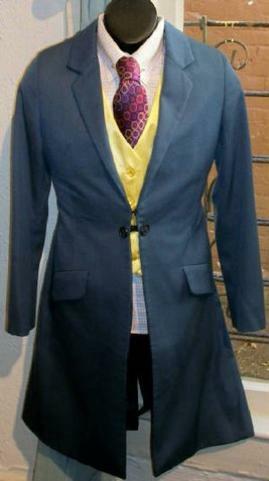 Has suede knee patches, snaps to hold coat skirts back and tab to hang number from on back of coat. 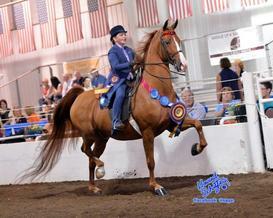 Derby was dyed to match and will need to be redyed/sprayed for larger shows. Will separate derby out if not wanted with suit. 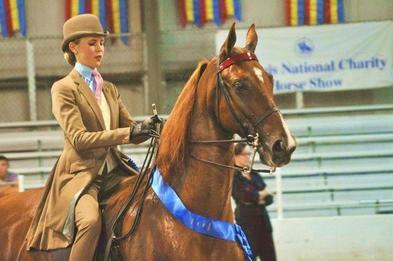 Jods have suede knee patches and tiny bit of ground in dirt on horse side of ankles. 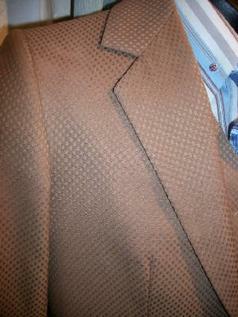 Coat has had second tiny hook and eye added above normal hook and eye, could easily be removed. Has suede knee patches and intentional spur holes. Has some nicks to bells and one bell has repaired spot. Jods have suede knee patches. 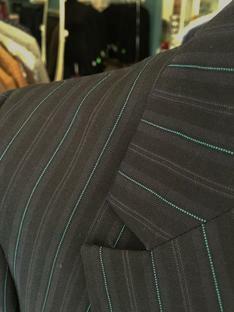 There is a rip on the corner of one front pocket and a two small repairs on back of one lower calf and bell of same leg. 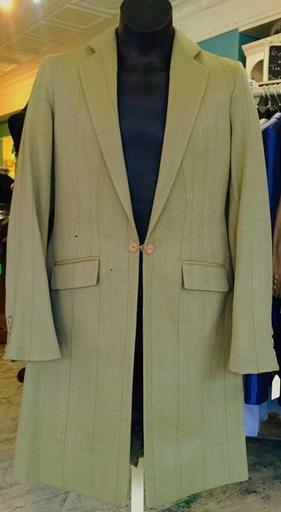 Coat Length: 32 1/4" plus 2 1/2"
Suit is part of the DeRegnaucourt apparel upgrade program. Jod One: Made with coat. Has suede knee patches and intentional spur holes. There is another set of spur holes that have been sewn closed. Both knees have repairs (see photos). Inseam: 28 1/4" plus 1 1/2"
Jod Two: Made a year later with suede knee patches and intentional spur holes. They have a second pair of spur holes that have been sewn closed. This pair is lightly used. 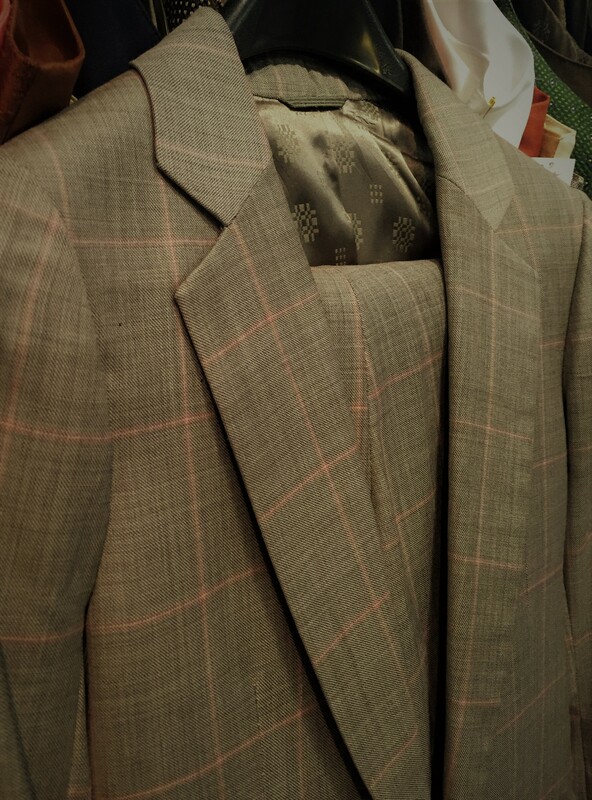 Waist: 33 1/2" plus 2 1/2"
Inseam: 30 1/4" plus 1 1/2"
Coat: Buttons on sleeves were moved when length was let out leaving marks where they originally were. 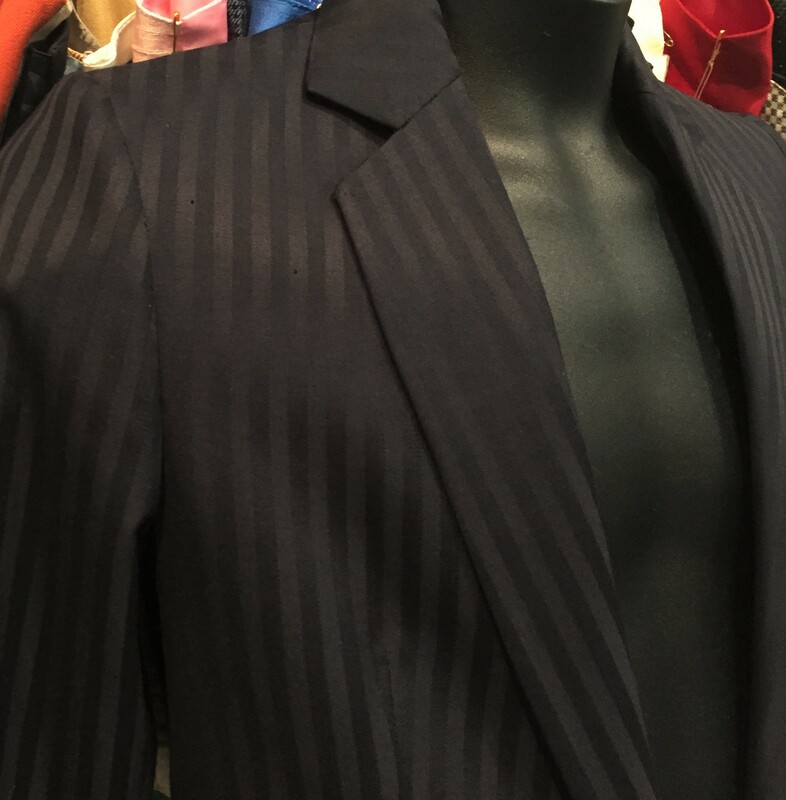 On bottom of coat extra fabric was added when length was let out leaving a seam on front of skirt edges and inside by lining. (See photos). 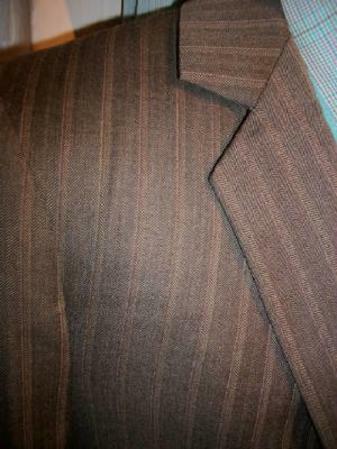 Suit color is a tad darker than photos show. Jods have suede knee patches and intentional spur holes. Each bell has a short vertical seam at the bottom of bell, one has ripped. Suede has shrunk a tad leaving fabric around them puckered. 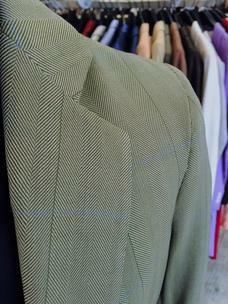 This is usually caused from the dry cleaners pressing the jods when the suede is still wet. 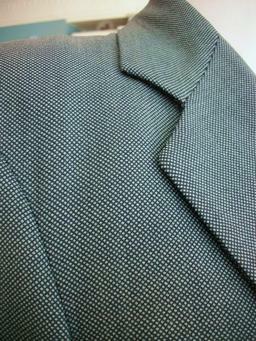 Fabric can be unstitched and smoothed back out. Lining at one arm hole has come unstitched some. Coat has snaps to hold skirts back. 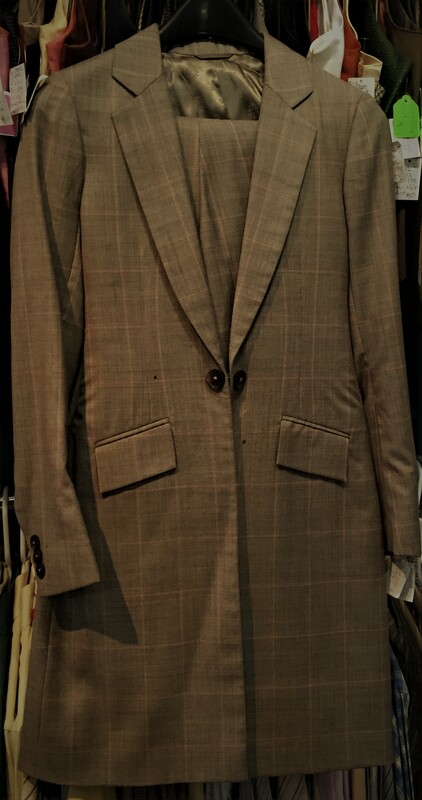 Jod Waist: 31" plus 1"
Nape to Waist: 14" darts have been dropped, can be raised back to about 13"
Length: 30 1/2" plus 1"
Suit is part of the DeRegnaucourt apparel upgrade program. Lightly used with suede knee patches and intentional spur holes that are still closed. There is some dirt on horse side of calves that may clean out. 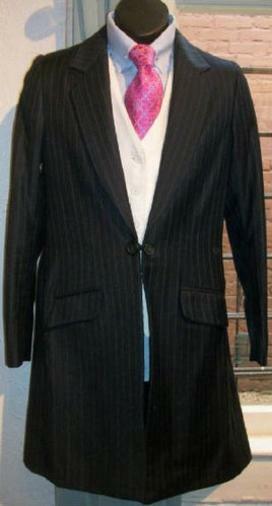 Morgan Grand National & World Championship winning suit is part of the DeRegnaucourt Apparel Upgrade Program. Fabric has gotten fuzzy. Jods have suede knee patches and intentional spur holes. There are some ground in dirt marks on bells on horse side. 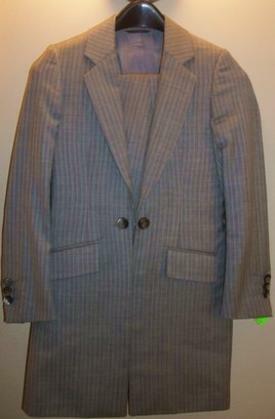 Jod Waist: 21" plus 2"
Inseam: 28 1/2" plus 3"
Sleeve: 19 3/4" plus 2"
Length: 29 3/4" plus 3"
This suit is part of the DeRegnaucourt apparel upgrade program. Very lightly used with suede knee patches and intentional spur holes that are still closed. Jod One: Made with coat and has suede knee patches and intentional spur holes that are still closed. Has small repair on one bell and a small hole in crotch. 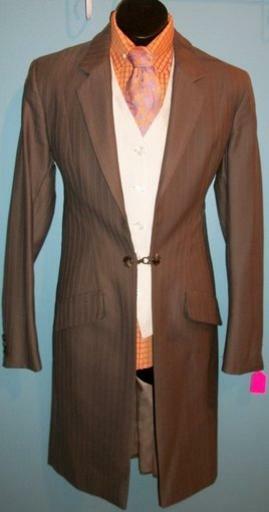 Jod Two: Made one year after suit with suede knee patches and spur holes that are still closed. 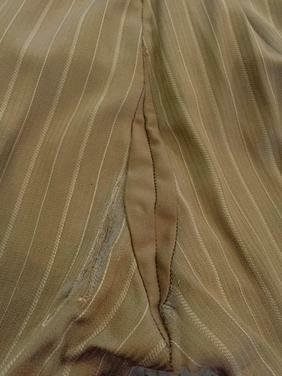 Right hip seam has two 1" long rips. Front rise seam is split 1 1/2". 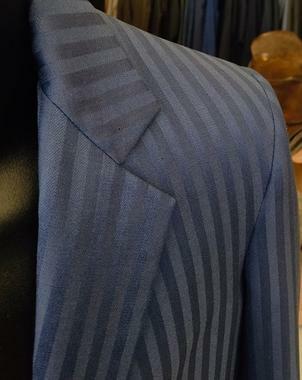 Coat: Middle back seam between darts has been stressed. 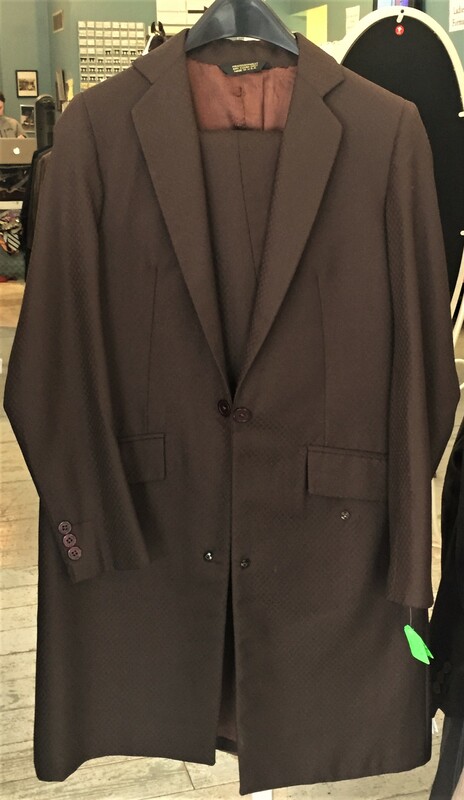 Suit is lightly used with suede knee patches and intentional spur holes. Lining at middle coat vent has come unstitched. 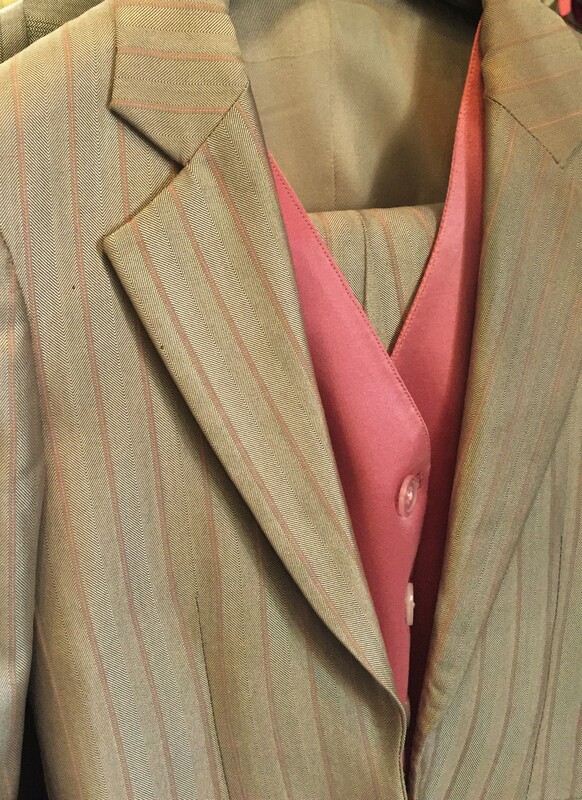 Inseam: 32 3/4" plus 2 1/2"
Nape to Waist: 13 1/2" darts were lowered, could be raised back to about 13"
Suit has two pairs of jods and matching dyed derby Size 7. Jod One: Made with coat. Have suede knee patches and intentional spur holes. Has small repair on inside left ankle and on outside of right knee (see photo). Waist: 29" plus 4 1/2"
Jod Two: Made three years later. Have suede knee patches and intentional spur holes. Seam on left thigh has started to come apart in small area. Waist: 32 1/2" plus 4"
Chest: 30" Feels like there MAY be let out under arms to let chest out. 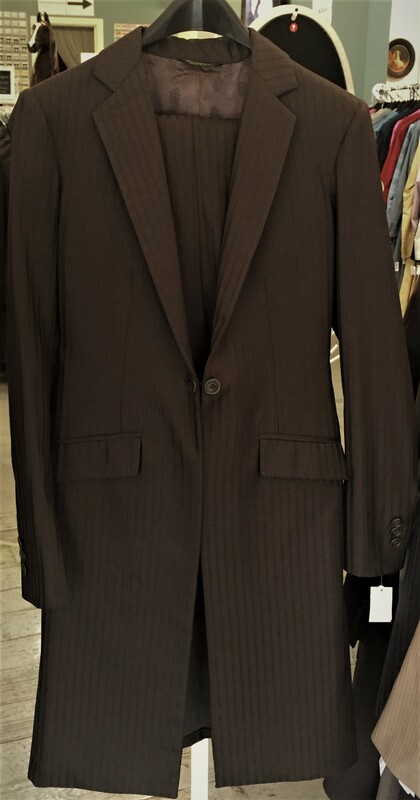 Suit is lightly used with suede knee patches. 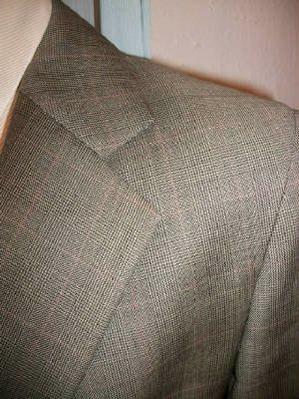 Lining at bottom of coat is not tacked down, but it may have been made that way. Length: 29 3/4" plus 1"
Very lightly used with suede knee patches and two sets of intentional spur holes that have been sewn closed. Bells have a few nicks and underarm lining of one arm needs restitched. 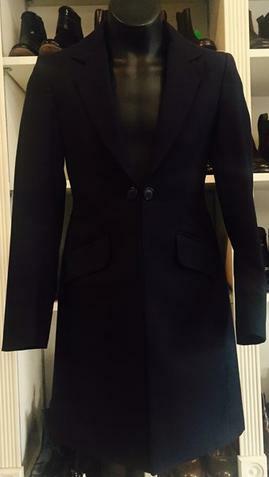 Coat has tab to hang number from and snaps to hold coat skirts back. 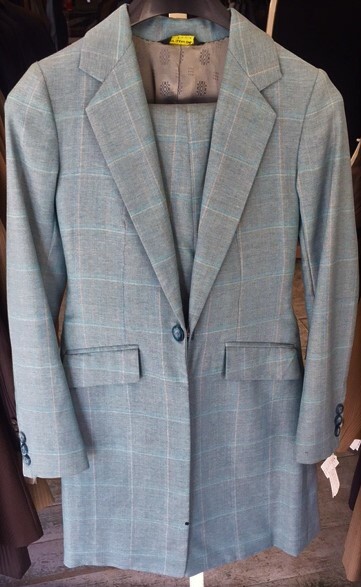 Suit has some years on it, but is lightly used with suede knee patches. Lining around one arm hole has come unstitched. 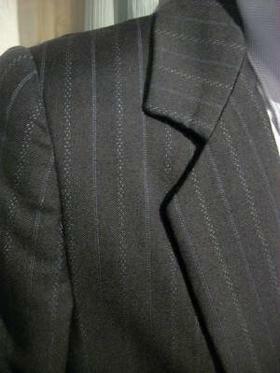 Pretty suit was only worn a couple times. Jods have suede knee patches. 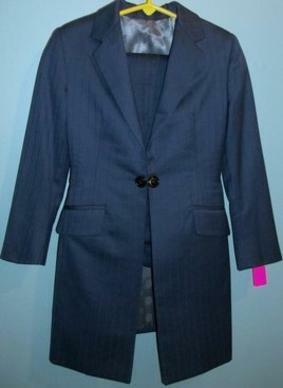 Coat has rounded front skirt bottoms, a trademark of Show Season suits. Jods have suede knee patches and intentional spur holes. A small holes has started on front rise of jods, crotch has been repaired and a small panel has been added to rear to add more room (see photo). There is the start of a small hole on outside of right bell. 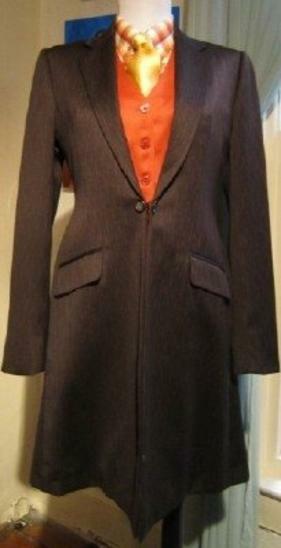 Coat has snaps to hold skirts back and tab on back to hang number from. Jods have suede knee patches, some dirt staining on bells and a few nicks on horse side of ankles. 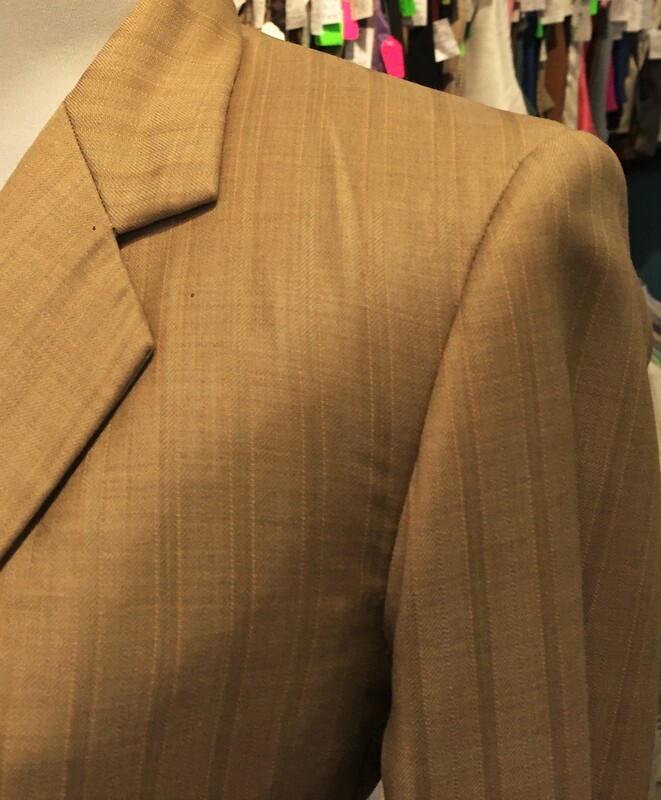 Coat lining around one arm hole and small amount of bottom coat lining could be restitched. Eye closure could be tightened down. Has pin hole on lapel from continuous use of lapel pin. Has some light staining on front left shoulder and underneath of right sleeve. Has suede knee patches. 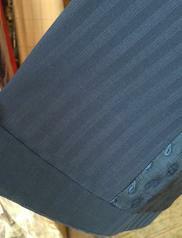 One pocket corner on jods has started to rip and has small stress tears at waistband. Bells have some nicks, small amount of fraying and dirt staining. One bell has had stitched repair. 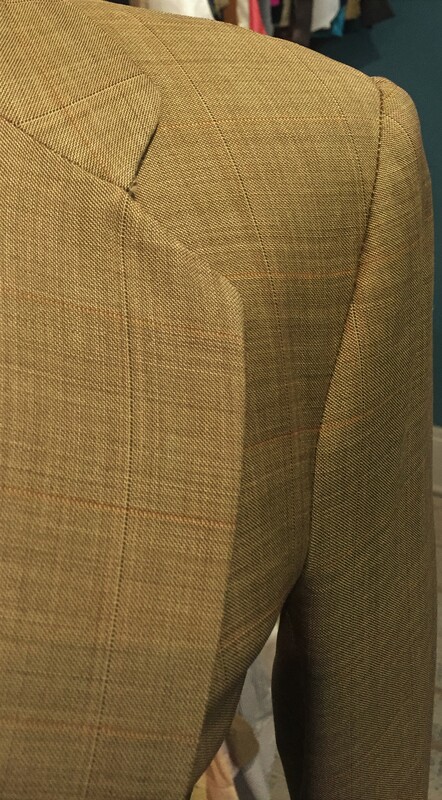 Coat arm holes need lining restitched and skirt lining. 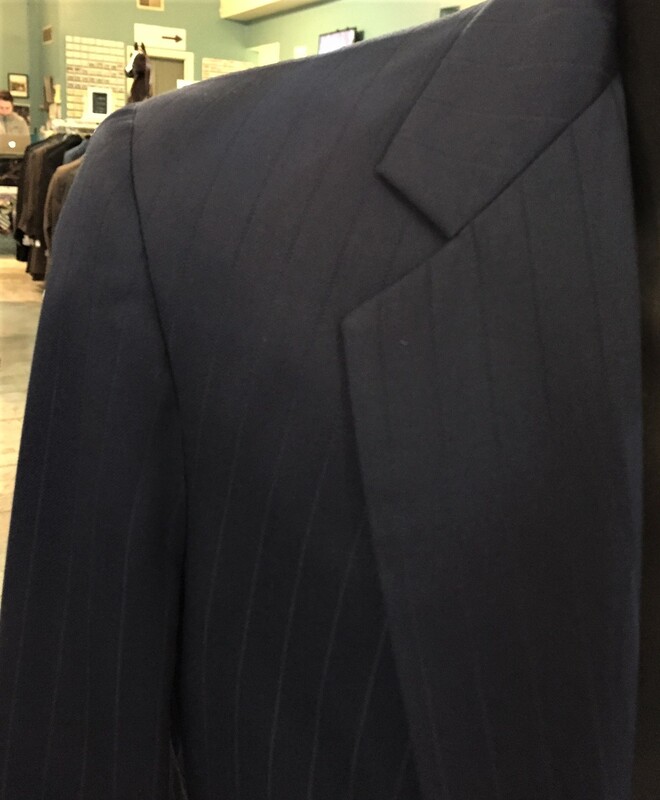 Color of suit is darker in person than photos show. Jods have suede knee patches. Corners of jod pockets have started to rip a touch. Ankle fabric has pilled a tad. Coat does not seem to have any flaws and has snaps to hold skirts back. Length: 31 1/4" plus 2 1/2"
Jods have suede knee patches. Black fabric has been added at crotch for more room. Jod bells have two repairs each. 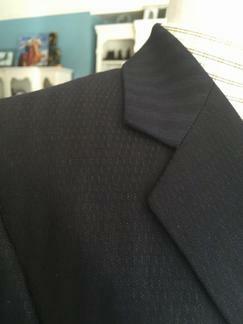 Sleeve cuffs only have one button each and there are nicks to fabric where other buttons once were. Jod One: Made same time as coat, has suede knee patches and intentional spur holes. Bells have a seam that was caused by folding fabric over to close a second set of spur holes. Inseam: 32 1/4" plus 1"
Jod Two: Made four months after coat with suede knee patches and intentional spur holes. 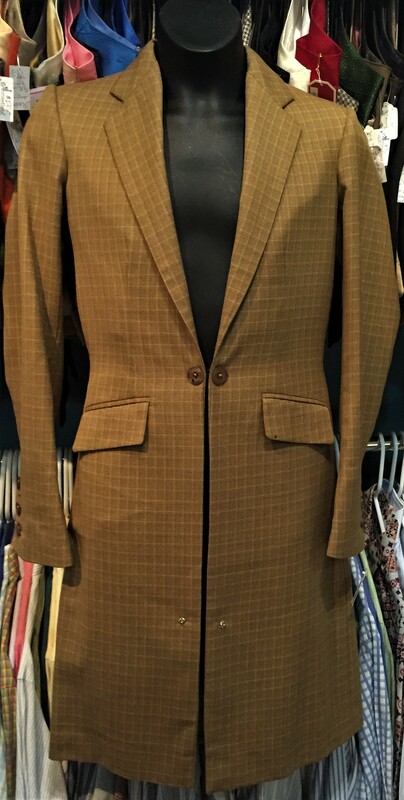 Waist: 23 1/2" plus 1 1/2"
Inseam: 33 1/2" plus 1"
Suit has suede knee patches and snaps to hold coat skirts back. Bells have a few nicks and repaired/stitched areas on both (pictured). 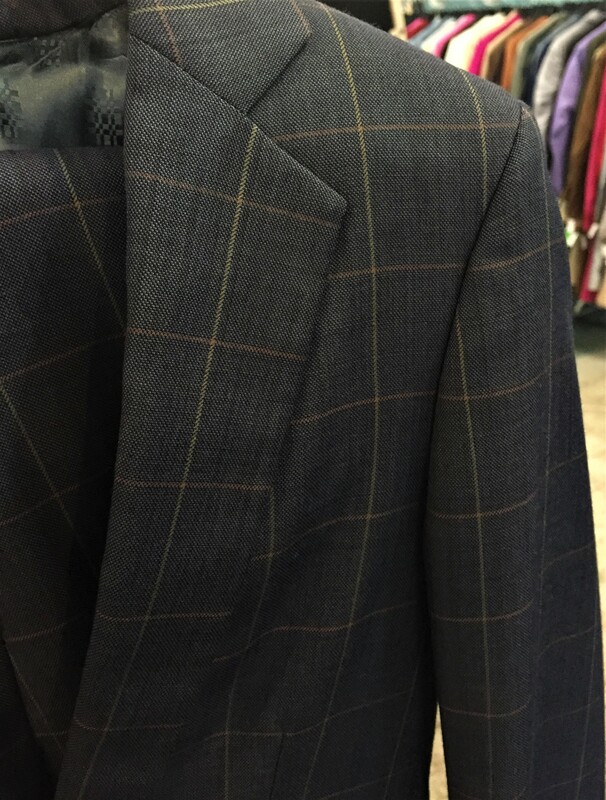 Coat has a few minor nicks to fabric. 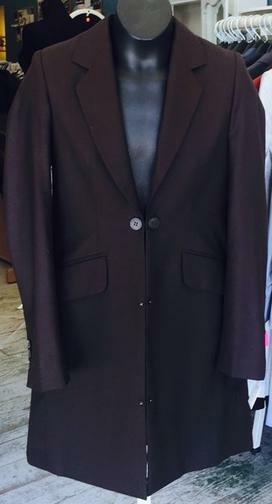 Suit is lightly used with suede knee patches. Lining around one arm hole could be restitched in one spot. Jods have suede and nicks to bells. Fabric at crotch has gotten a tad fuzzy. 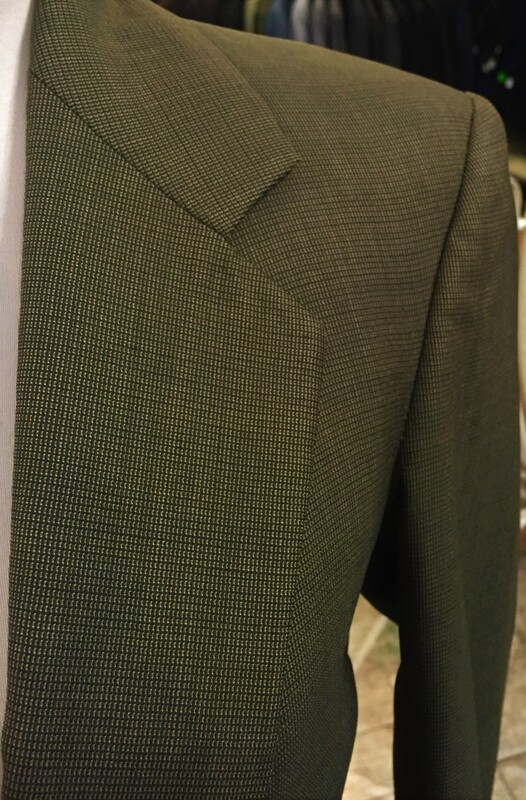 Lining around one armhole and small areas of bottom of coat skirt has come unstitched. Jods have suede knee patches and intentional spur holes that go through top layer of fabric but not hemmed fabric. Jods have some minor nicks in fabric from outside seams being let out. 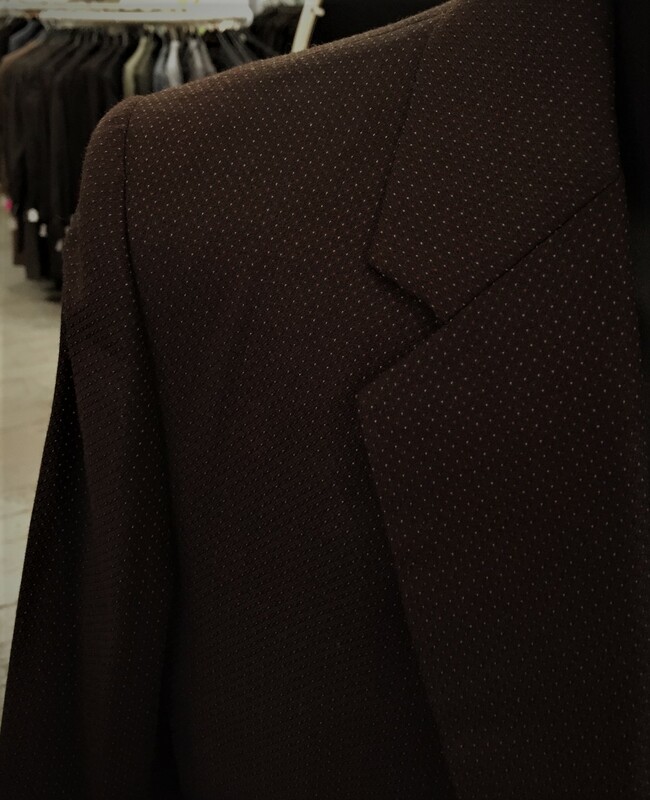 Front buttons on coat were raised leaving minor nicks where they were previously. 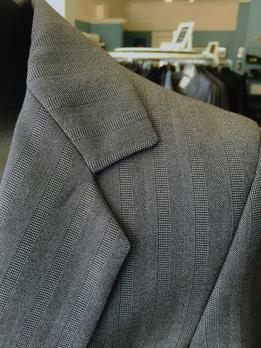 Pocket flaps have been raised to make pockets appear higher. 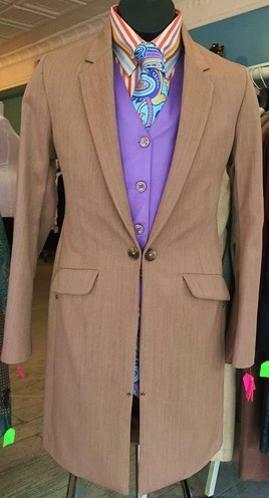 Lightly used with suede knee patches and snaps to hold coat skirts back. Jods have suede knee patches. Both bells have some nicks to fabric and a small hole each. There are a few nicks down seat from where seam was let out. Lining at one sleeve cuff has come unstitched. Jod Waist: 28" no let out"
Very lightly used with suede knee patches. Have a few nicks to bells, nothing major and some ground in dirt I think will clean out. 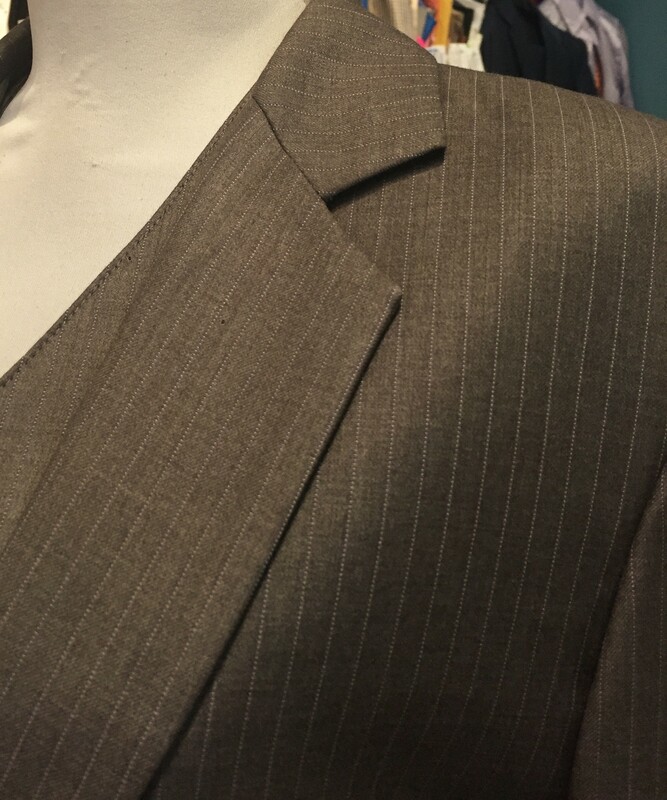 Suit is darker in color than photos show. Jods have suede knee patches One corner or one jod pocket has started to rip. Jod Waist: 22 1/2" plus 4"
Sleeve: 22 3/4" plus 1 1/2"
Length: 32" plus 2 1/2"
Jods have suede knee patches and intentional spur holes that only go through first layer of fabric, but not through hem fabric. Must have been added when length was let down and then length was taken back up later. One bell has tiny hole also through only top layer and other bell has repair. Jod Waist: 21 1/2" plus 3"
Jods have had black suede added. There are some nicks of fabric down legs and on bells. One bell has small repair. Both bells have some faint dirt staining. 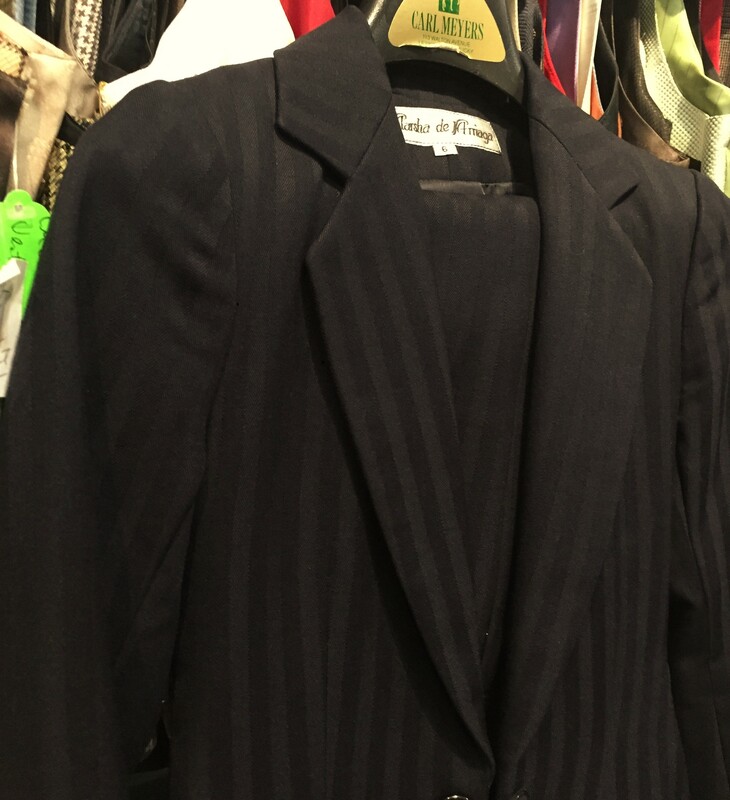 Coat has hooks that hook onto small loops of thread to hold skirts back. 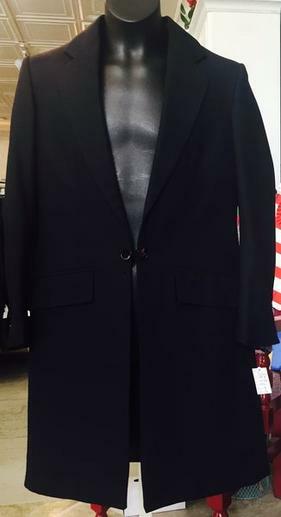 Coat has tab on back to hang number through. 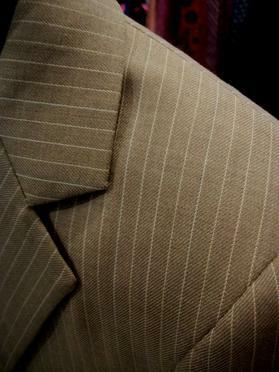 There is a small rip on collar at back of neck that should be hidden (see photo). 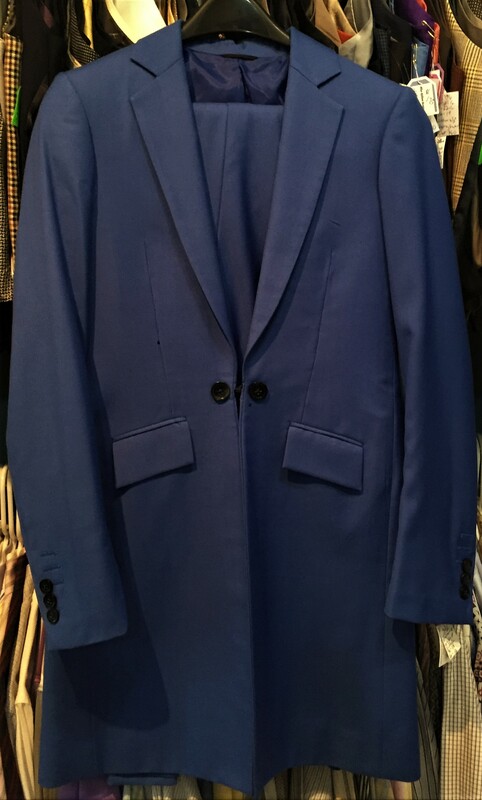 There are nicks to fabric where front coat button was lowered. 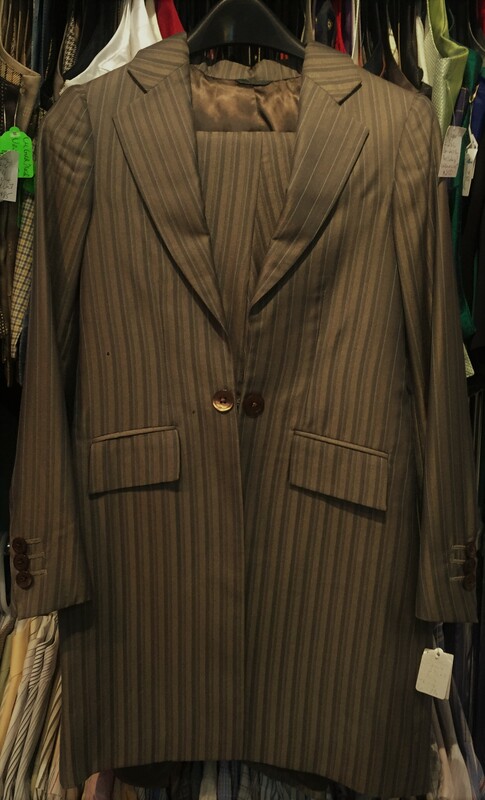 Sleeve: 20 1/4" plus 1"
Length: 30 1/4" plus 1"
Suit is very lightly used with suede knee patches. Jod Waist: 27 1/2" plus 1 1/2"
Very lightly used with suede knee patches. Does have some light dirt spots on jods that should clean out. Suit is so much prettier in person than photos show. Has nice sheen. 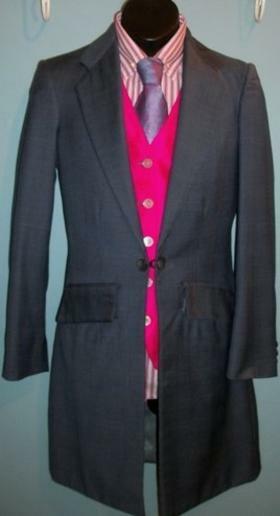 Suit comes with two pairs of jods, however one pair looks as if it has been put through the washing machine so they were not measured. Jods have suede knee patches. Jods have dirt staining on bells and inside of ankles. One bell has a small hole on outside. Fabric has a few minor nicks. 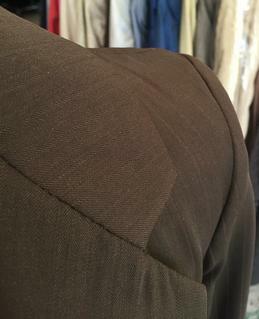 Coat has one small hole through top layer of fabric near nape. See photos below. Jods have suede knee patches and some ground in dirt at ankles. 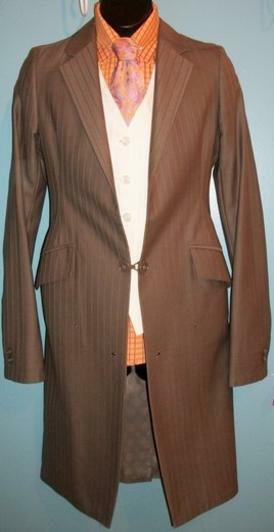 Coat has some smudges and nicks at wrist cuffs. 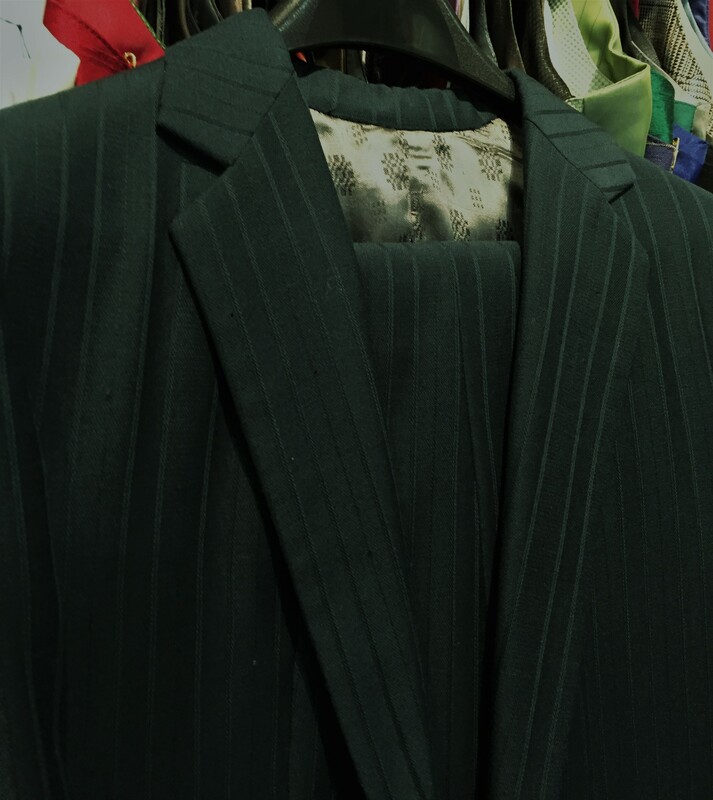 Suit is greener in person and has suede knee patches and intentional spur holes. One spur hole is stitched at the bottom where it has ripped. Same bell has tiny rip patched from the inside. Have suede knee patches and bell edges have some fraying. One armhole has come unstitched. Gorgeous fabric has lots of sheen. Jod One: original to coat. Has suede knee patches and intentional spur holes. Seam right below zipper has been restitched about 1". Bells have a few minor nicks and calves and bells have discoloration from sweat. Jod Two: made a year later. Has suede knee patches and intentional spur holes. Calves and ankles have some discoloration from sweat. 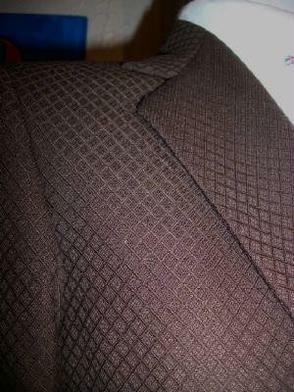 Coat: Bottom lining has come unstitched in a few areas. 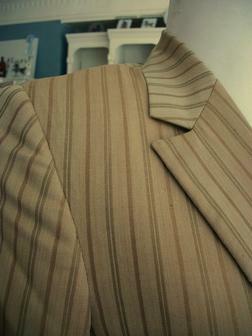 Back of coat skirts has some discoloration from sweat. Jods have suede knee patches and intentional spur holes. 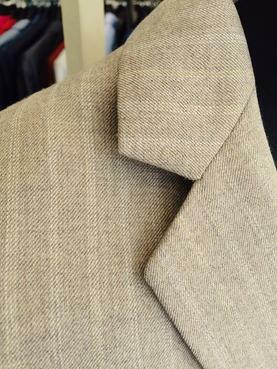 A corner of each front jod pocket has started to unravel. There are some nicks to fabric on bells and one tiny hole started on side of left knee. This could easily be patched from inside. 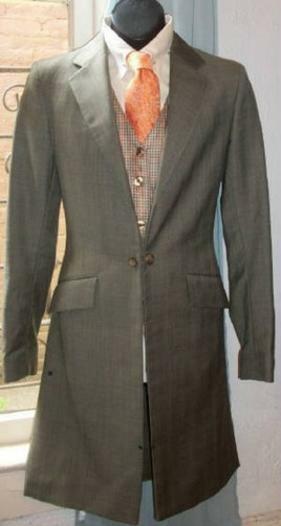 Coat has a few nicks to fabric and faint lines where cuffs were let out. See below for close up pictures. Length: 31 1/2" plus 1 1/2"
Jods have suede knee patches. 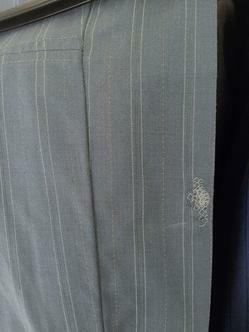 Crotch has been repaired from a previous rip but has ripped again and will need patches (see photo below). One bell has some nicks to fabric (see photo below). Lining around one arm hole has come unstitched. Coat has snaps to hold skirts back. 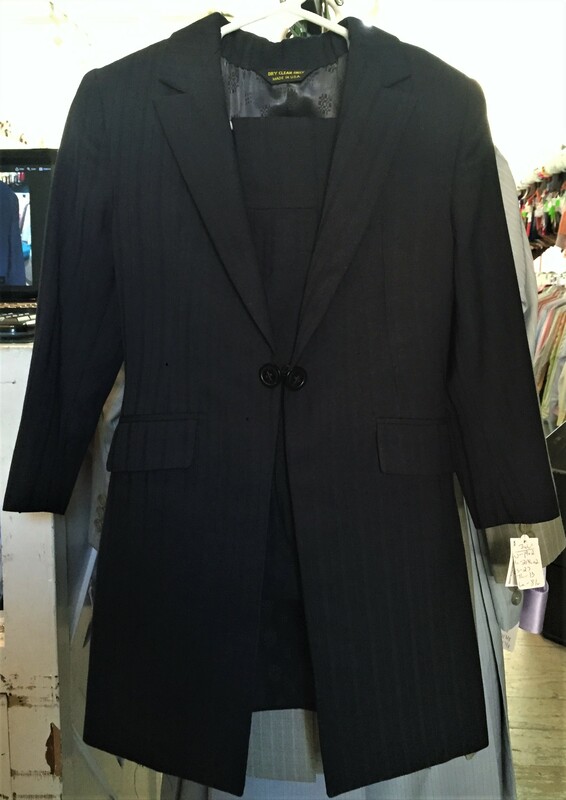 Jod Waist: 28 1/2" plus 1 1/2"
Inseam: 29 3/4" plus 2 1/2"
Coat Length: 31" plus 3"
Jods have suede knee patches. Both bells have been repaired/stitched in areas and both have some nicks to fabric. There are also some nicks down rear where seam was let out. 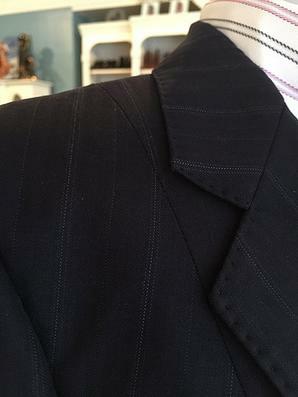 Coat lining at one arm hole and on bottom has started to come unstitched in small areas. Very lightly used with suede knee patches. One jod leg does have small hole started on outside of leg under knee. 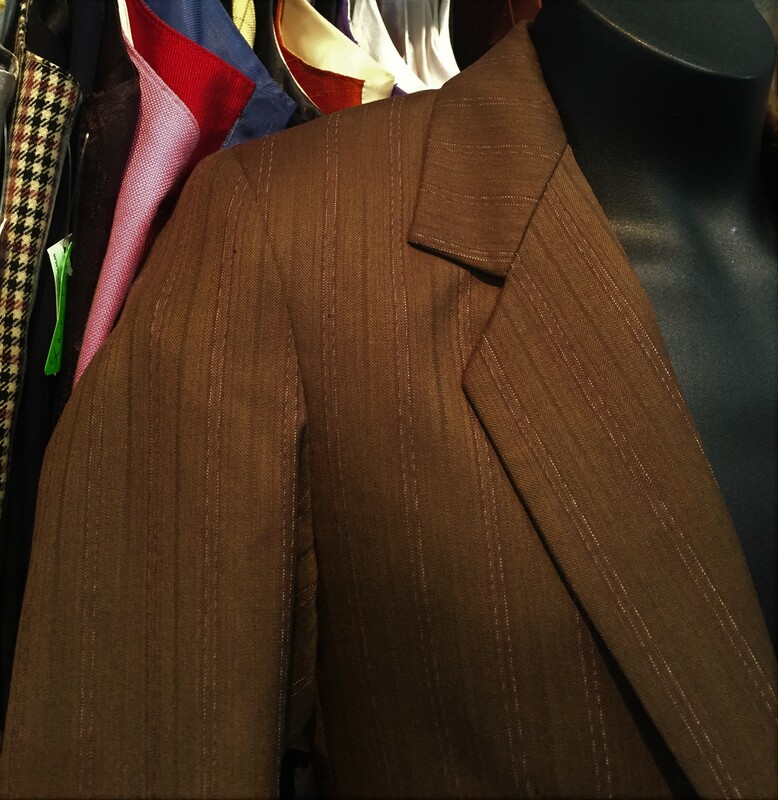 Suit is very lightly used with suede knee patches, intentional spur holes, snaps to hold coat skirts back and tab to hang number from. Has one tiny repair on inside one thigh and has been repaired/stitched on out side of one knee. 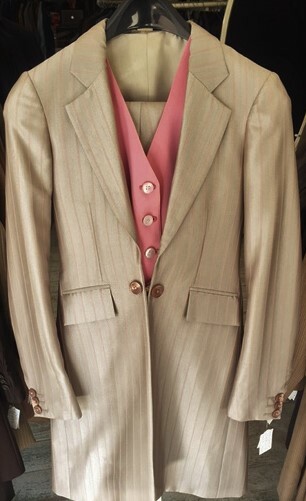 2011 suit is lightly used with suede knee patches and snaps to hold coat skirts back. 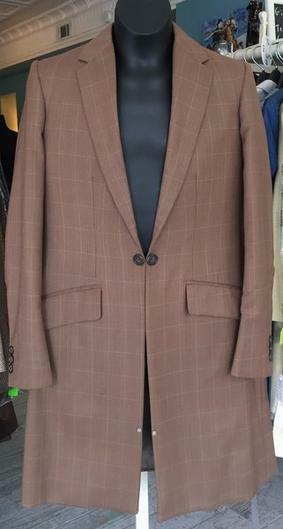 Suit is lightly used with suede knee patches. There are a couple dirt marks on one sleeve cuff that may clean out. 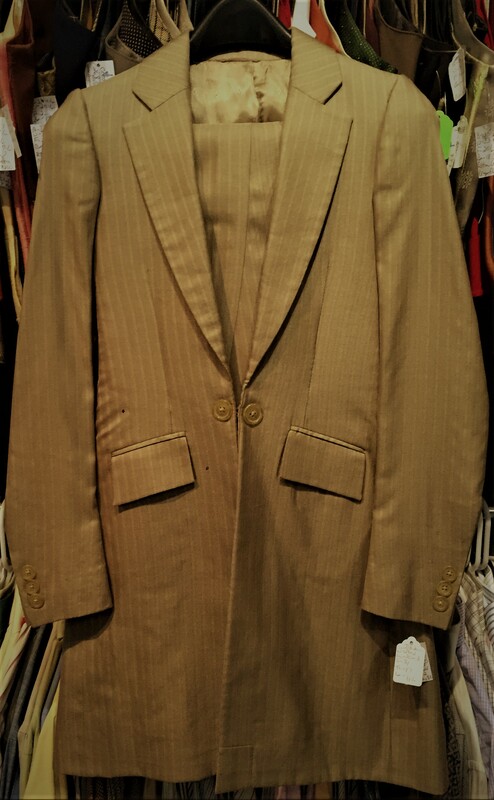 Jod Waist: 23 1/2" plus 3"
Sleeve: 24" plus 1 1/2"
Length: 35" plus 1 1/2"
2011 suit is very lightly used with suede knee patches. Coat has snaps to hold skirts back. Both arm hole linings need restitched. Jods have suede knee patches and one bell has smudge that may clean out. 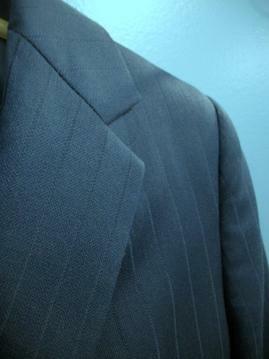 Color of suit has a touch of grey to it. Jods have suede knee patches and suede seat that do not connect and intentional spur holes. 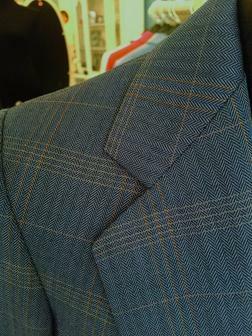 One corner of each front jod pocket has started to unravel. Each bell has a small stitched repair. 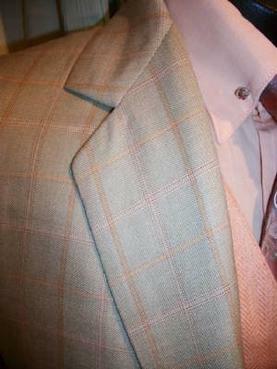 Coat has a small moth hole on each side of front flaps that will not be seen once flaps are pinned back. 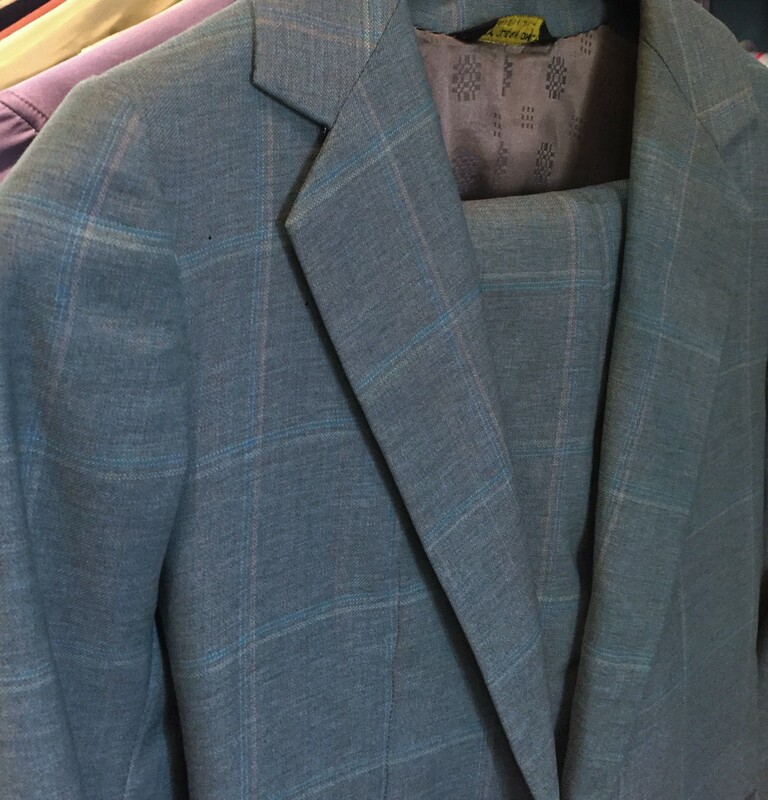 Length: 29" plus 2 1/2"
Suit is part of the DeRegnaucourt Apparel Upgrade Program. Color is a tad darker than photo shows. Fabric has no pattern. Lightly used with suede knee patched and intentional spur holes. Bells have a few very minor nicks to fabric. Left shoulder has a shoulder pad stitched on that could easily be removed. Tiny spot of bottom coat lining has come unstitched. Jod Waist: 28 1/2" plus 3 1/2"
Inseam: 33 1/2" plus 3"
Length: 37" plus 1 1/2"